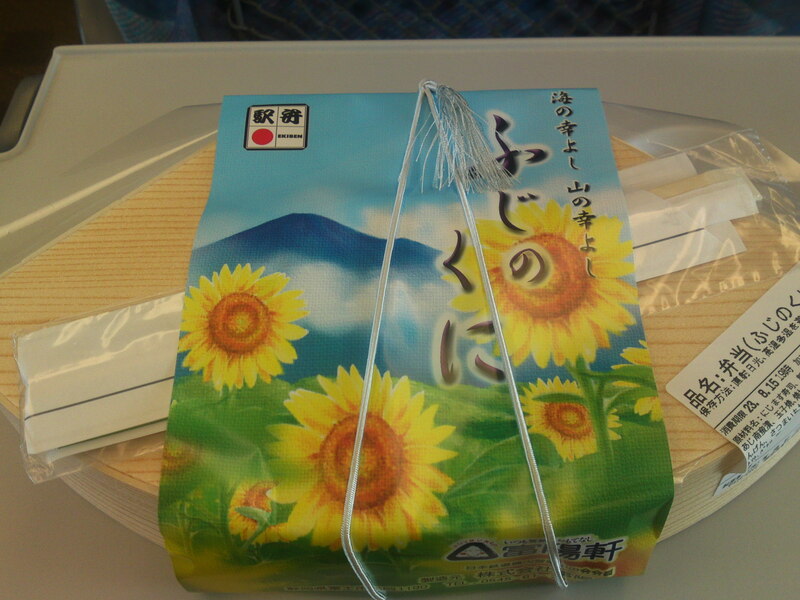 Yesterday on my way to Mishima City I managed to grab a Fuji No Kuni Ekiben at Shin Fuji JR Station (one of the two distinct stations in Fuji City) as the train was kind enough to stop for 5 minutes and allow me to buy it from the booth on the platform! 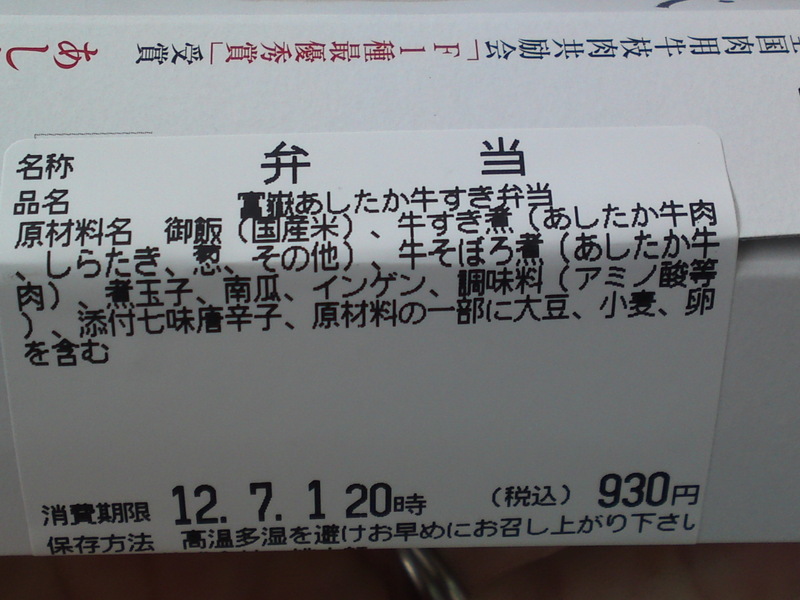 What with all the photographs to take I couldn’t finish it on the train and had to spend some time on the train platform in Mishima JR Station before I could leave to cover Mishima Taisha Festival! 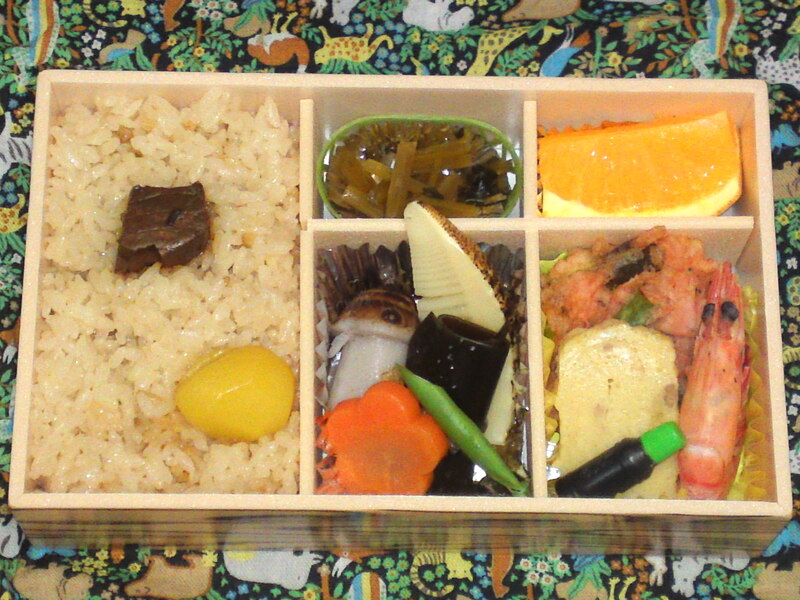 “Fuji No Kuni” means “Mount Fuji’s Country” and this ekiben is a collection of Shizuoka Prefecture specialties! 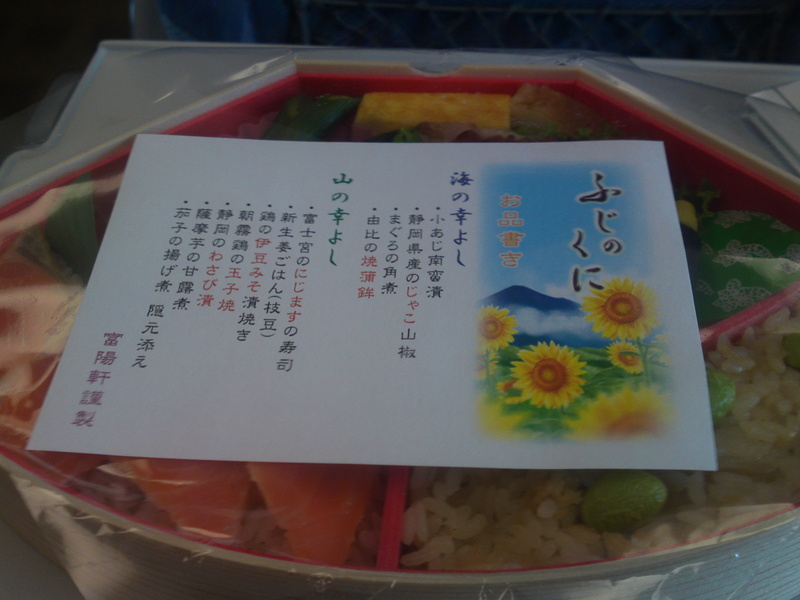 Ekiben written both in Japanese and English! 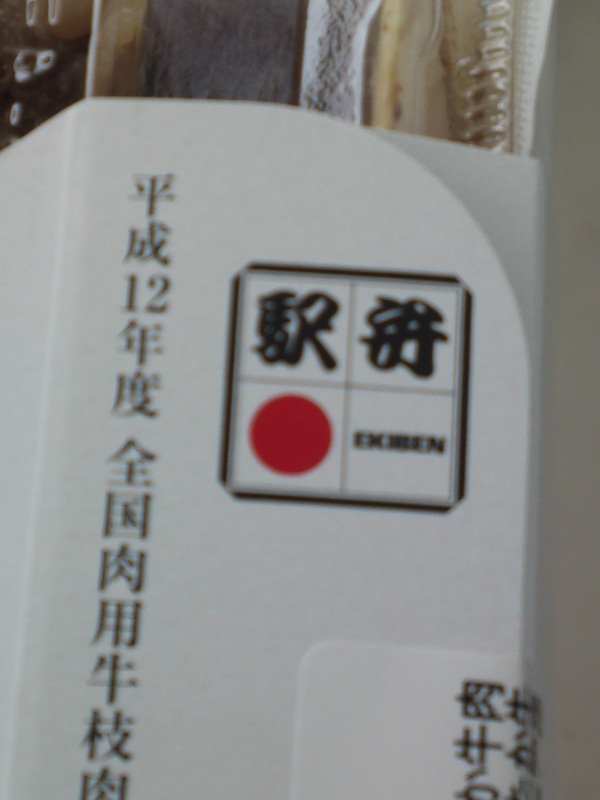 Like all ekiben companies tomiyouken Co. Ltd/富陽件 had clearly stated the contents on their price tag! 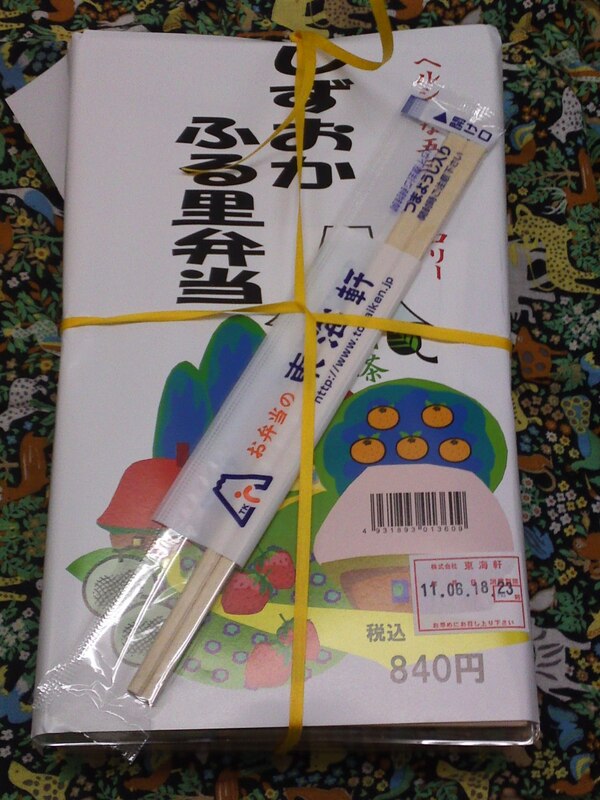 Chopsticks are found between the wrapping paper and the cover. 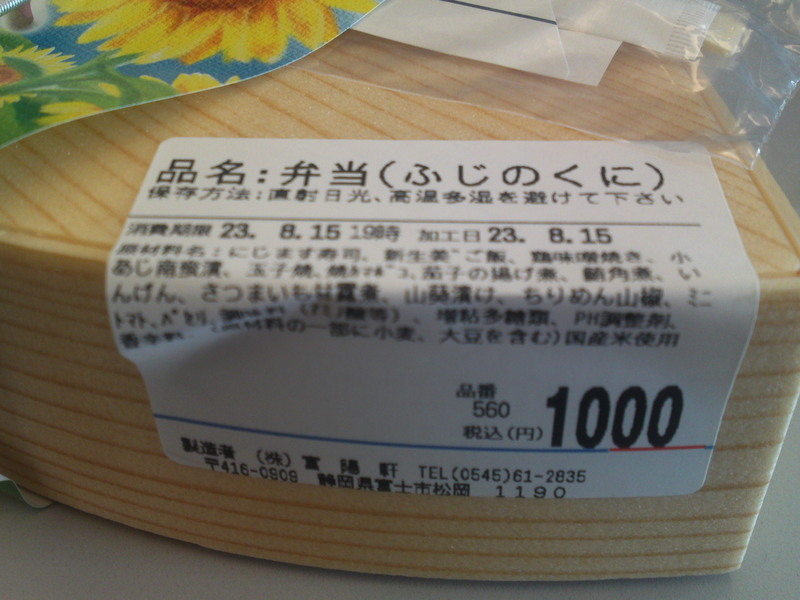 A complete explanation on a cute design is found on a small leaflet atop the transparent paper protecting the efood inside! Another collector’s item? 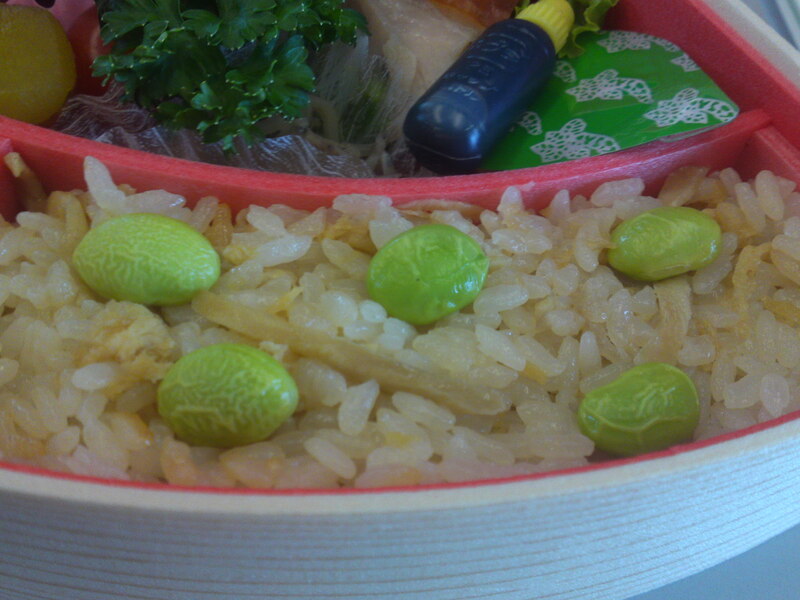 Fresh ginger rice with edamame/新生姜ごはんと枝豆! 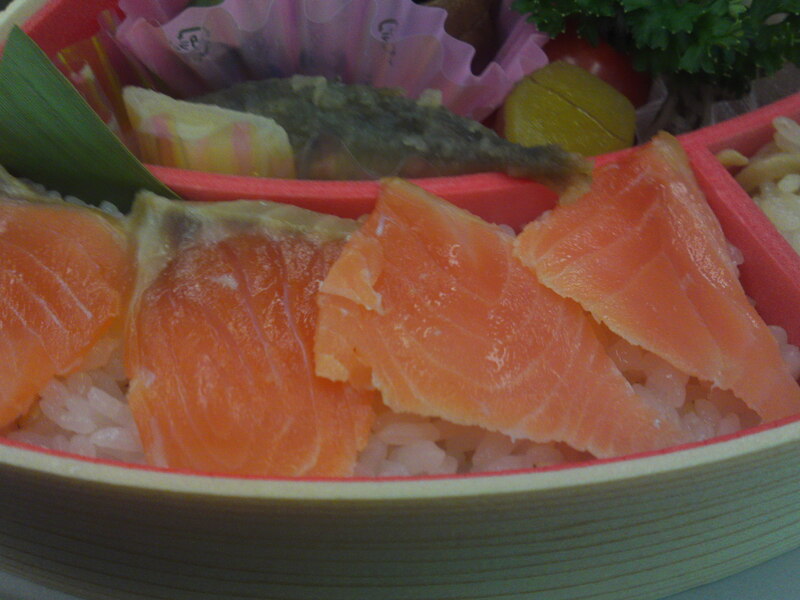 Fujinomiya City rainbow trout sushi/富士宮市のにじます野寿司! A great combination of products from the sea and the land there! 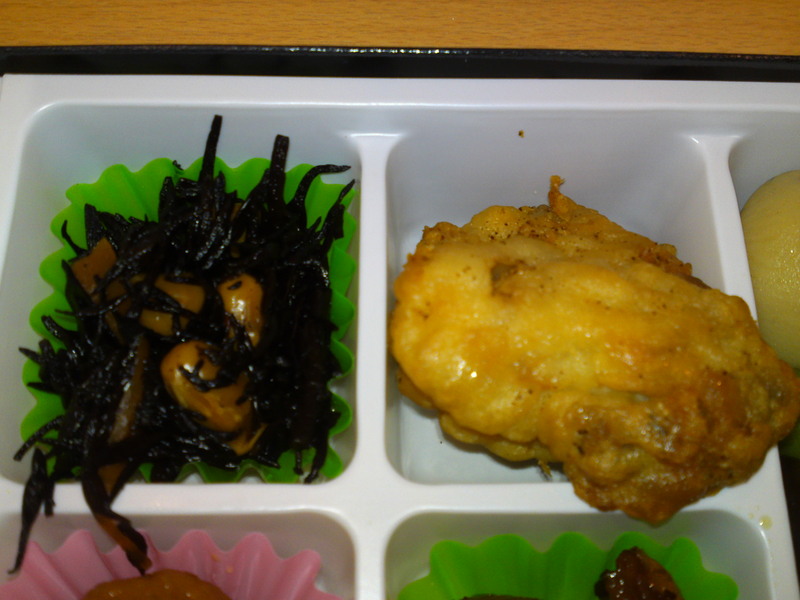 Ko aji nanban zuke/こあじ南蛮漬/small pickled horse mackerels. 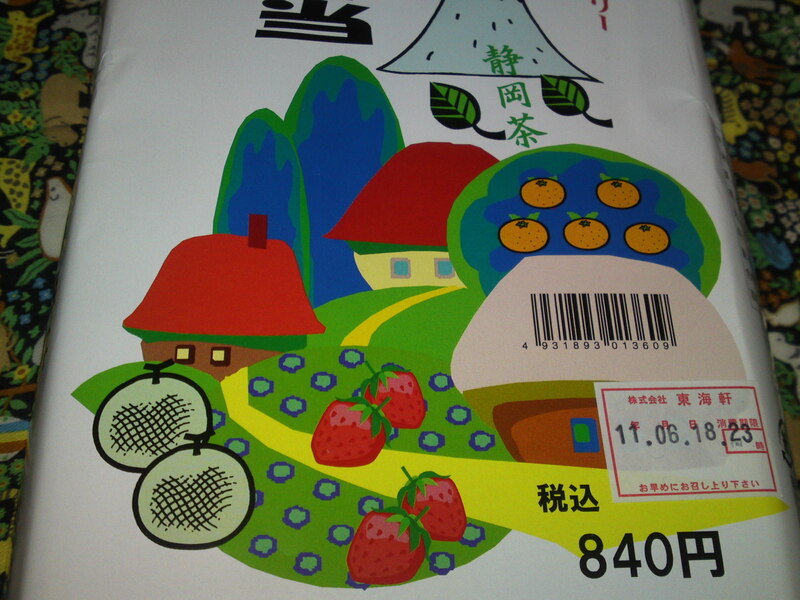 Shizuoka Prefecture Jyako Japanese pepper/静岡県産のじゃこ山椒/Jyako Sansyou. Nasu no Ageni/茄子の揚げ煮/grilled and simmered eggplant/aubergine. Ingen/いんげん/stringbeans. Parsley/パセリ, mini tomato/ミニトマト. 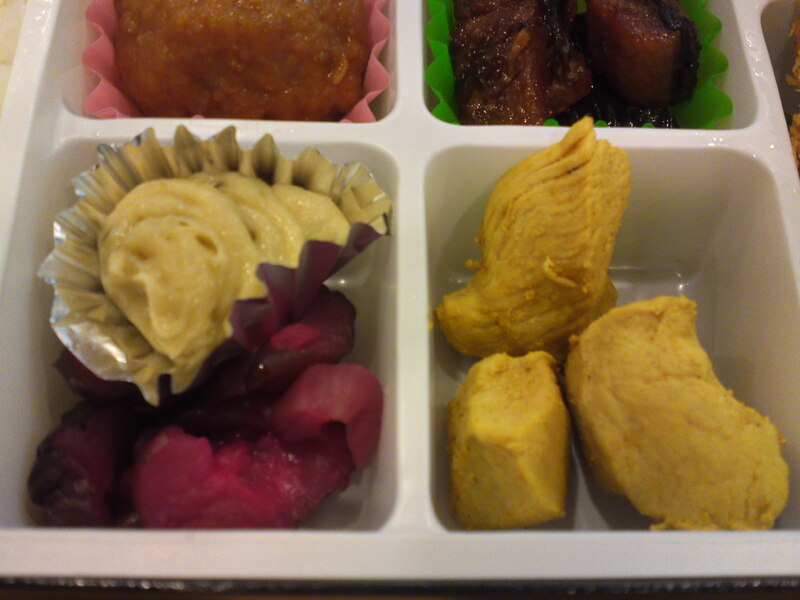 Satsumaimo no amatsuyuni/薩摩芋の甘露煮/sweet potato simmered in sweet juices. 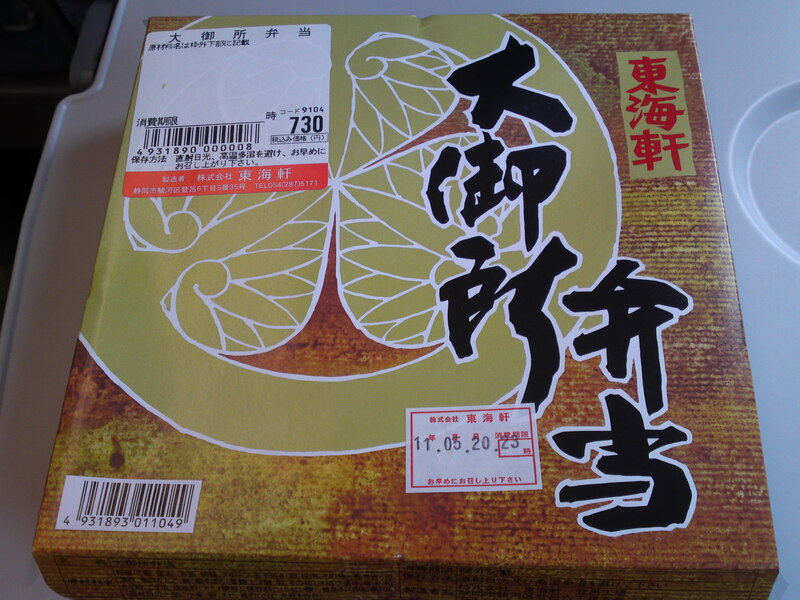 Shizuoka Wasabizuke/静岡産山葵漬/Wasabi pickles from Shizuoka Prefecture in its capsule. 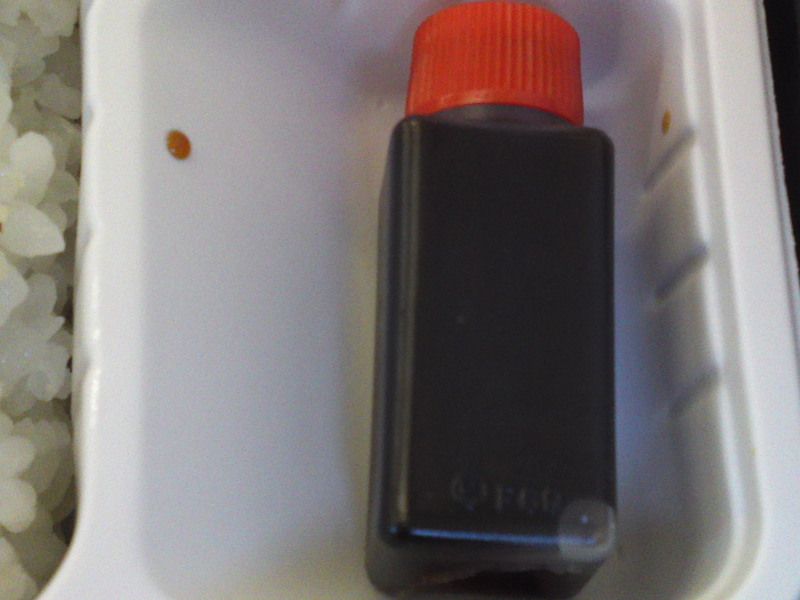 Small bottle of soy sauce. 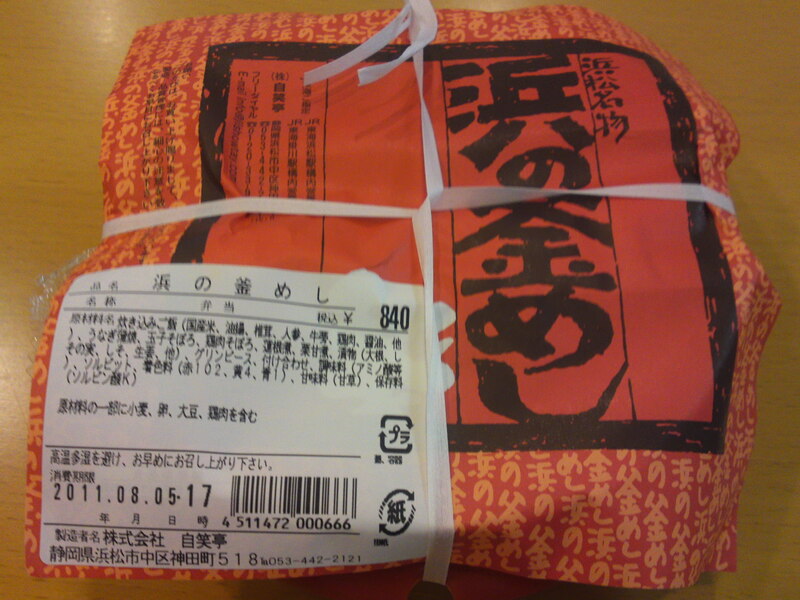 On the right Niwatori no Izu Miso tsukeyaki/鶏の伊豆みそ漬焼き/Chicken grilled with miso paste from Izu Peninsula. 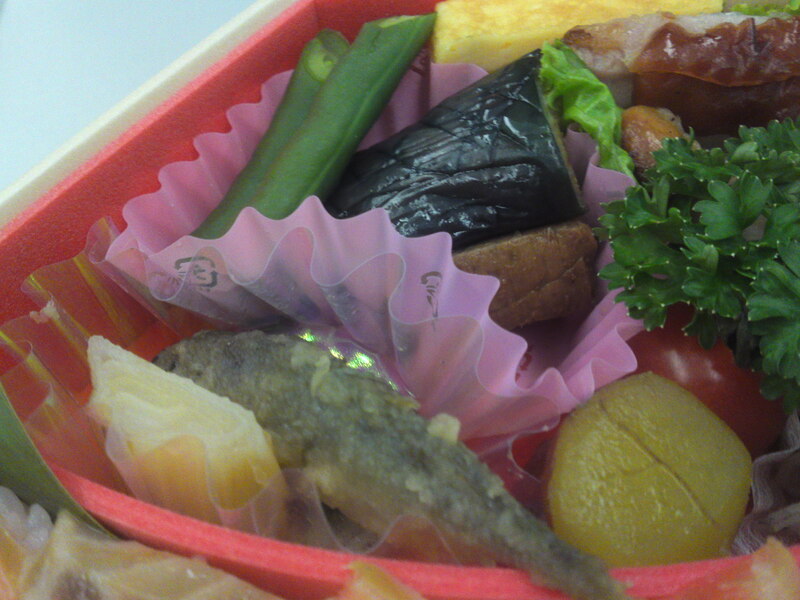 At the top near the omelette, a slice of Yui no Kamaboko/由比野蒲鉾/Fish paste from Yui. On top Amagi Shamo no Tamagoyaki/天城軍鶏の卵焼/Tamagoyaki-Japanese omelette made with Amagi Shamo chicken eggs! I hope you will not need a dictionary! In any case, absolutely delicious and intriguing! 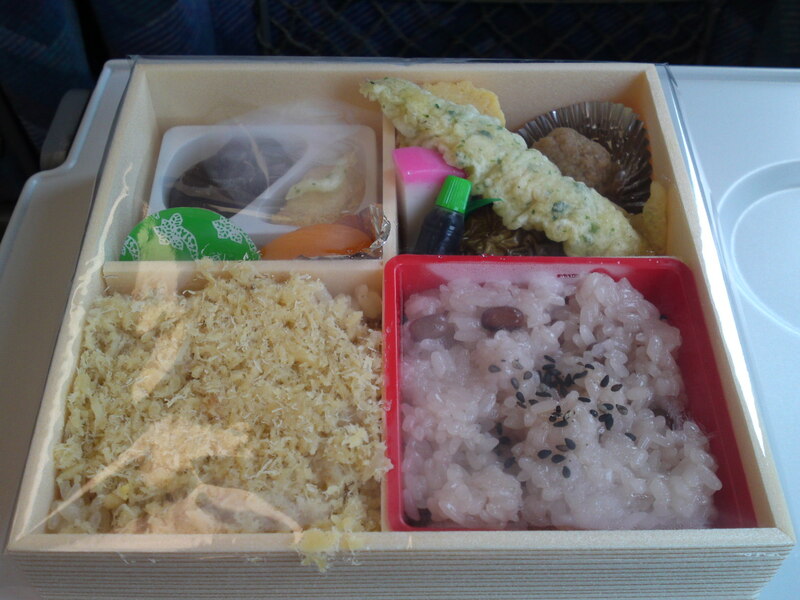 Although both seem to have their own, the JR Stations of Kakegawa City and Hamamatsu City share quite a few ekiben/railway lunch boxes! Hamamatsu Meibutsu/浜松名物/Hamamatsu Famous Product, Hama no Kama Meshi/浜の窯めし/Hama stands for Hamamatsu, Kama for a kind of cauldron and Meshi for Rice/Lunch. 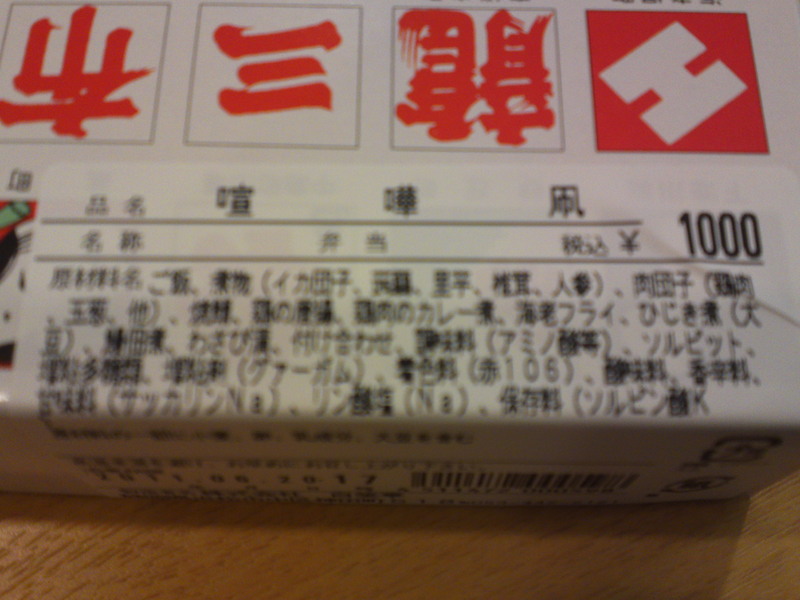 Jishotei Co. clearly announces the ingredients! 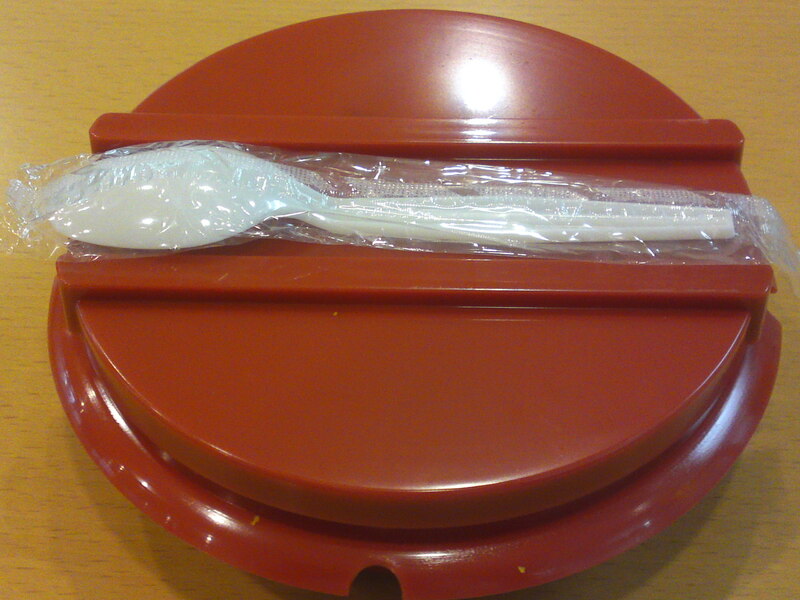 Interestingly enough, they provide a spoon instead of chopsticks. You’ll see why later! 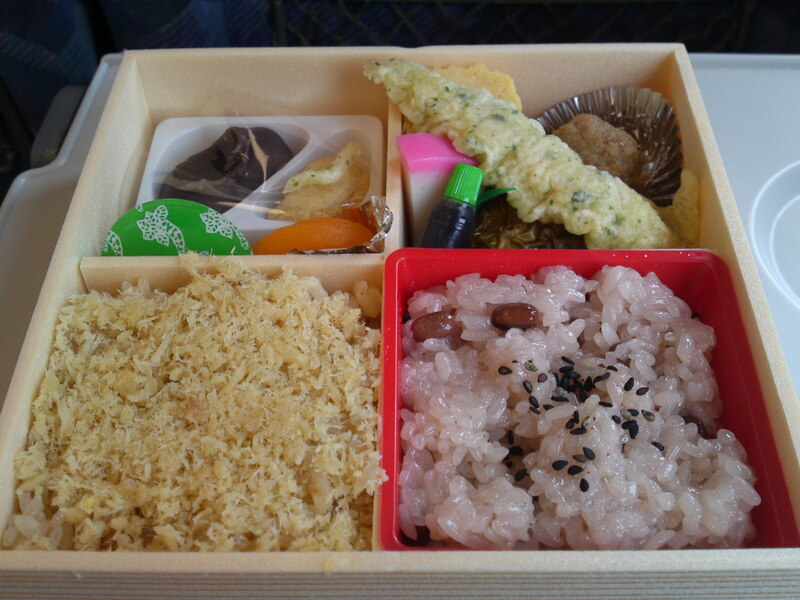 The rice is of the takikomi gohan type, meaning that it was steamed with the juices of some ingredients placed on top of the rice as well as containing soy sauce and bits of shiitake mushroom. carrot, burdock root and chicken. 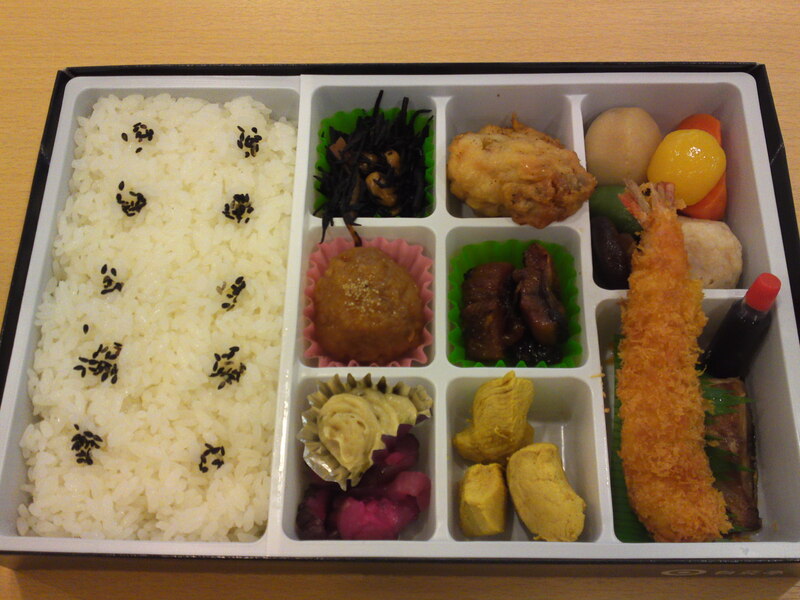 Th lower right quarter was covered with chicken soboro, or “powdered chicken, while the left quarter was covered with Japanese cucumber pickles mixed with bits of shiso. 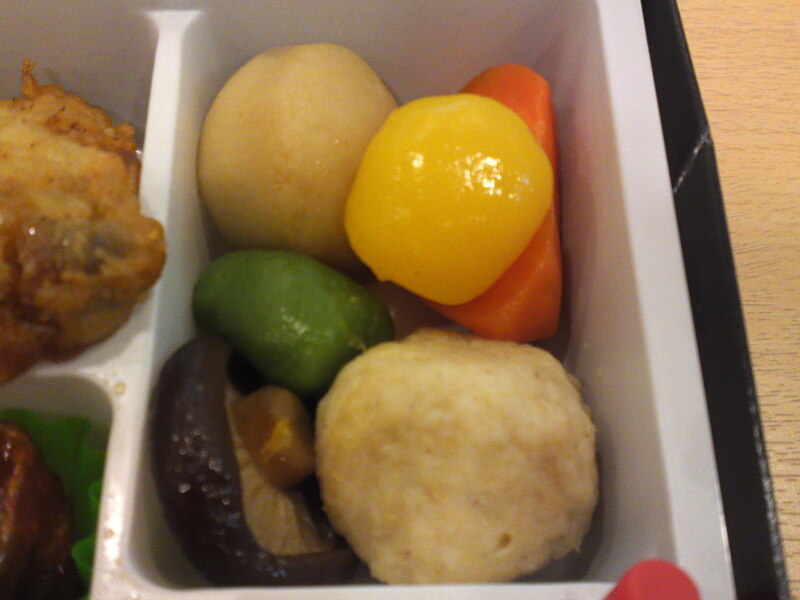 In the center was placed a small simmered shiitake. 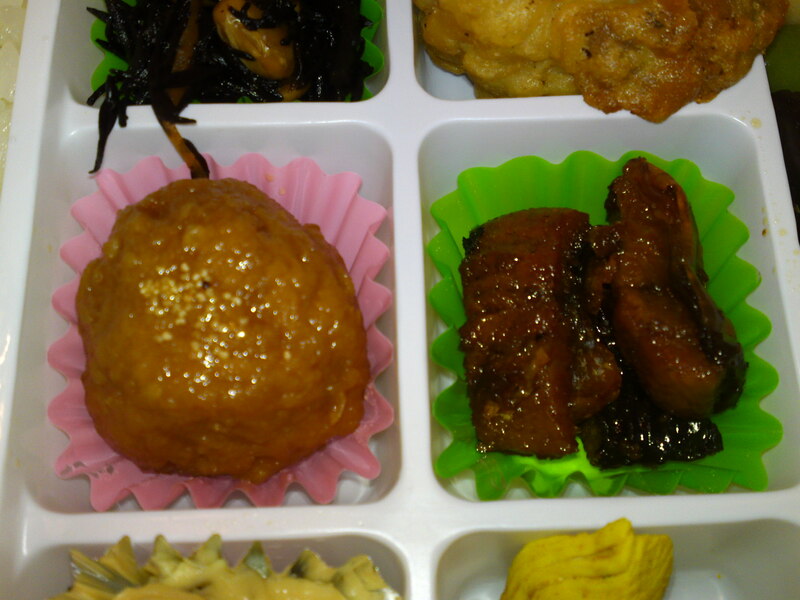 In the middle from right to left, red pickled ginger, boiled carrot and chestnut cooked in syrup. 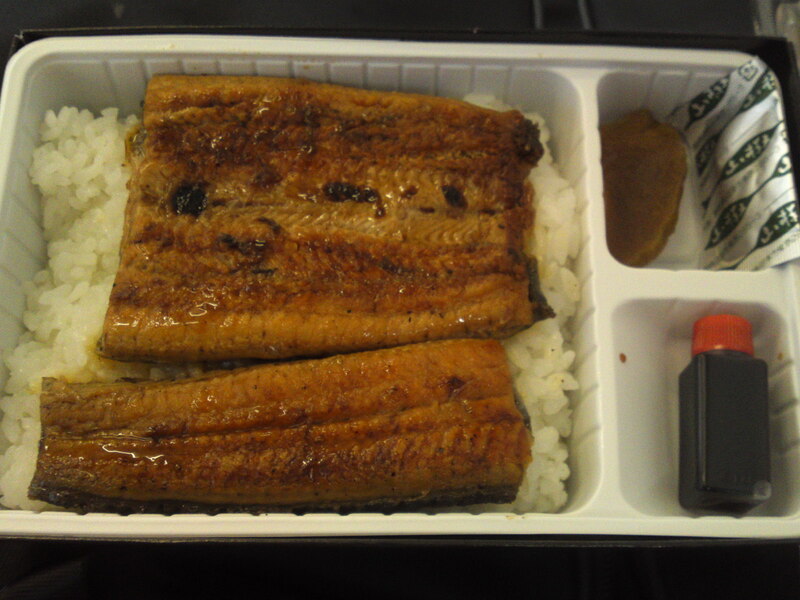 There was also broiled eel in the middle! 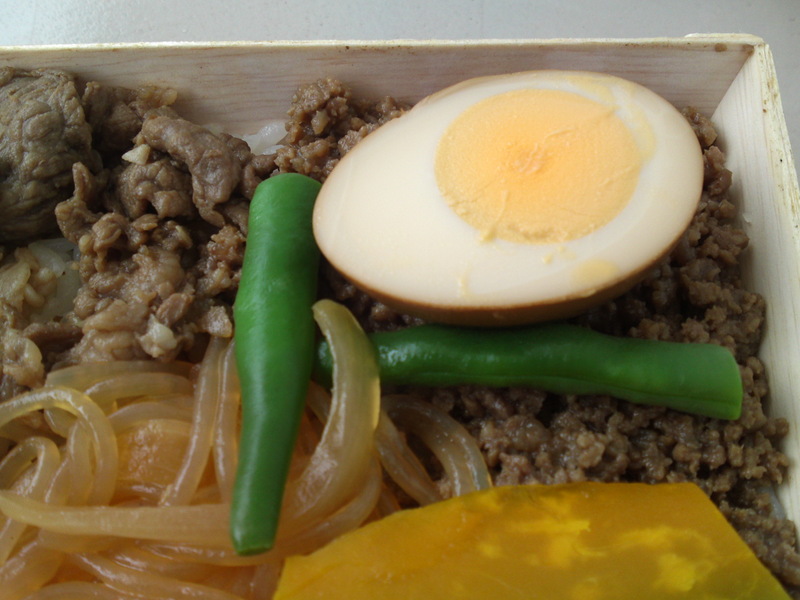 The upper half was covered with tamago soboro, sweet powdered oemelette, with green peas. 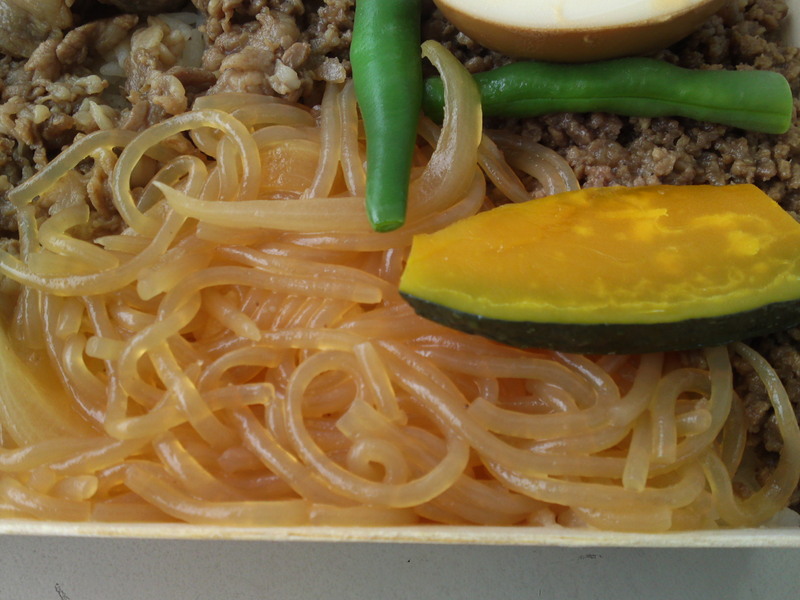 A half slice of boiled lotus root was also included for taste and design! 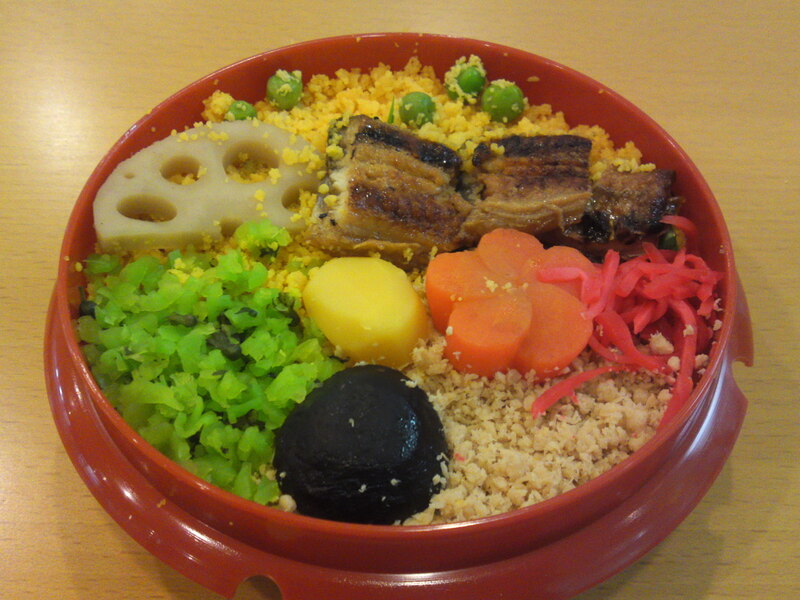 As the “cauldron” was deep the whole ekiben was very satisfying and yummy! 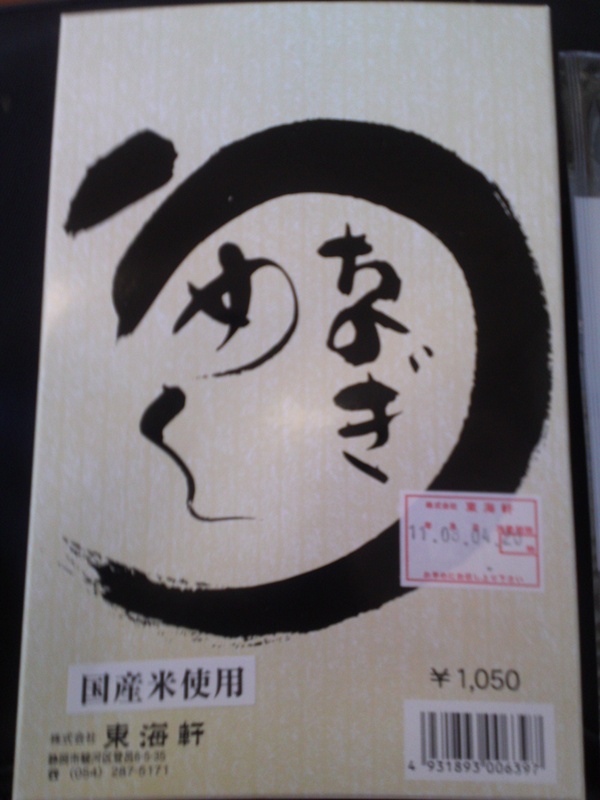 Unagi/Eel/鰻 is one of the famous local products in Shizuoka Prefecture and they are particularly popular in Summer! The eels are first grilled then repeatedly dipped into tare/sauce and broiled over a live fire. 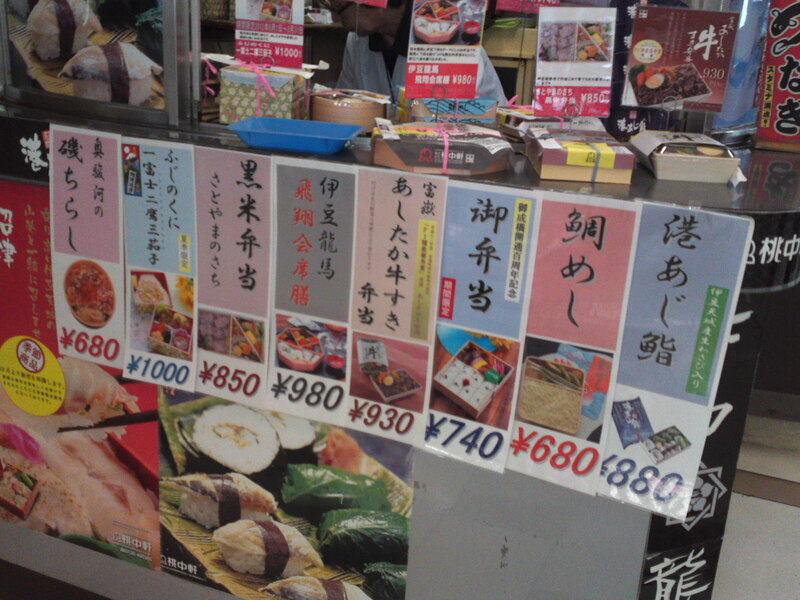 There are many recipes for them and accordingly, tastes even vary from city district to city district! 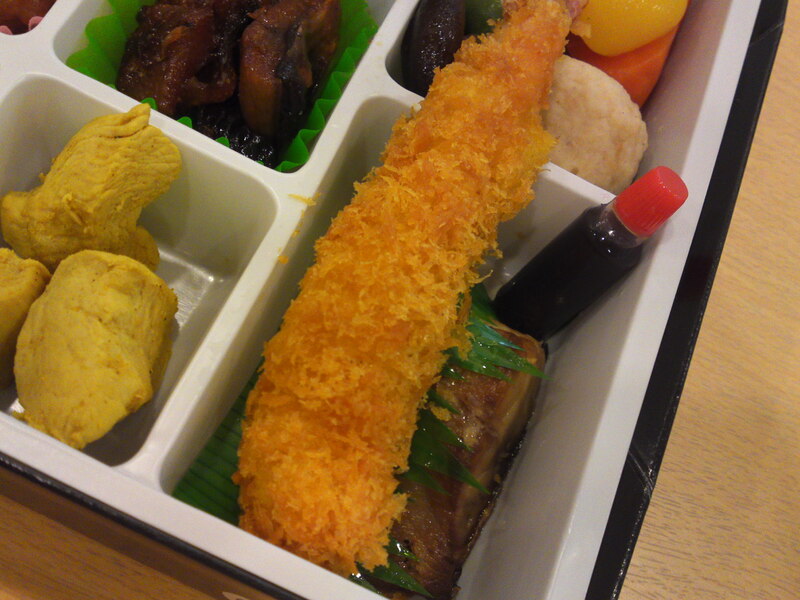 Tokaiken Co Ltd. offers a single ekiben with eel simply called unagi meshi/うなぎめし/Eel Lunch. 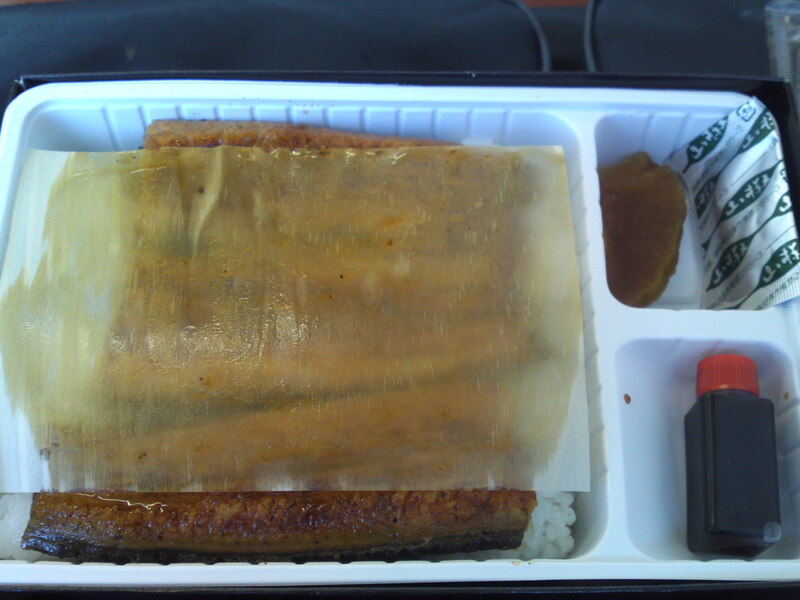 A film of special paper prevents the eel to stick to the box cover! 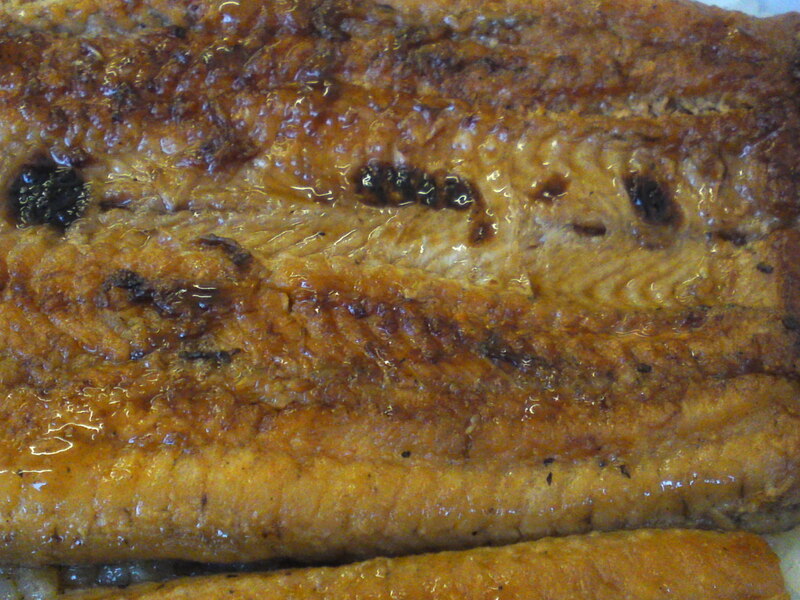 It all looks simple but this eel has been carefully broiled! 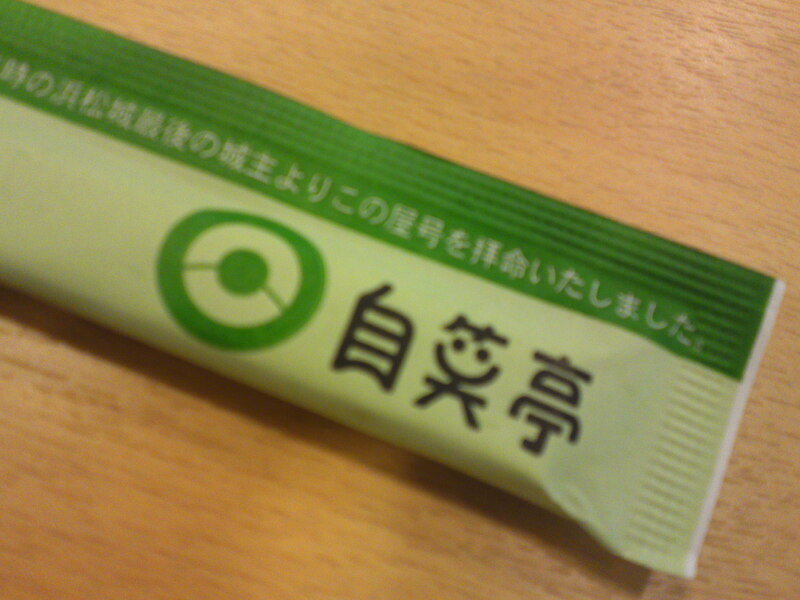 A small bottle of extra “tare/たれ” sauce is provided! 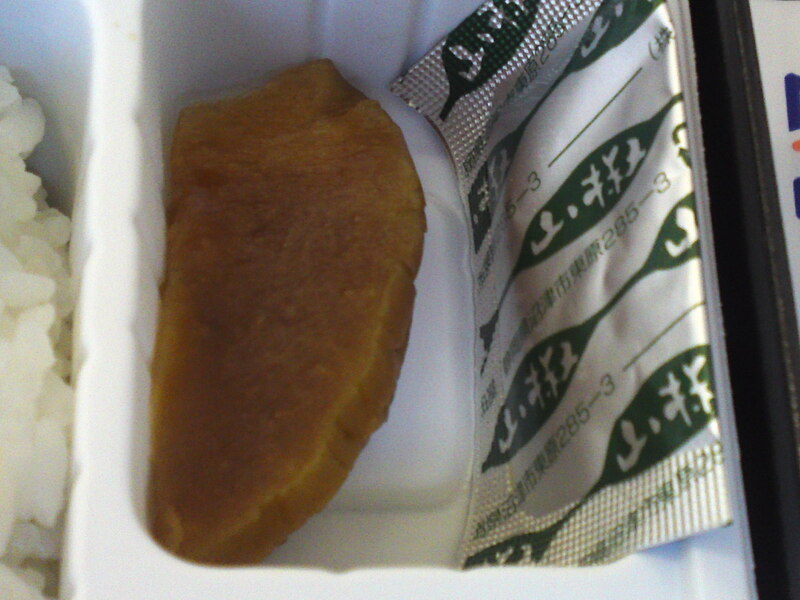 Pickled daikon and a sachet of Japanese pepper/sanshyou/山椒 for more seasoning. 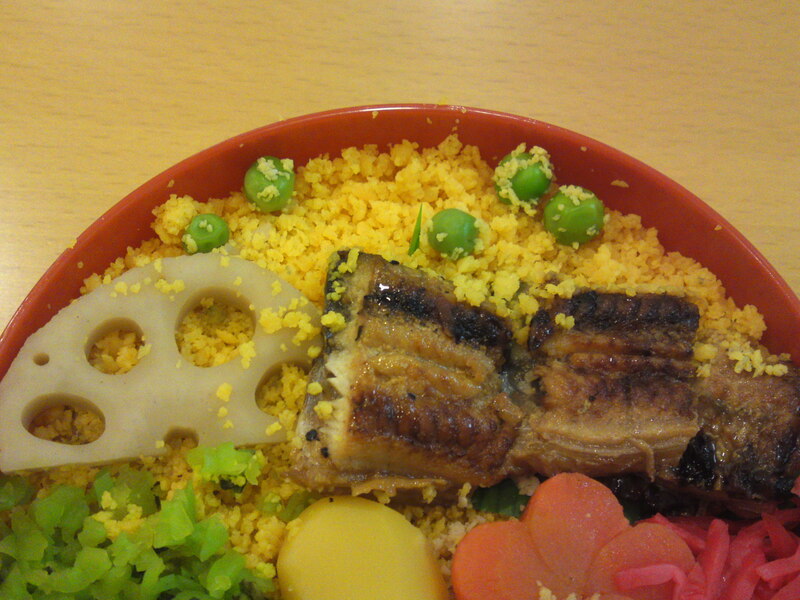 That’s how it looks after having sprinkled the eel with the “tare” and the “sanshyou” powder! One scoops it with chopsticks together with rice. 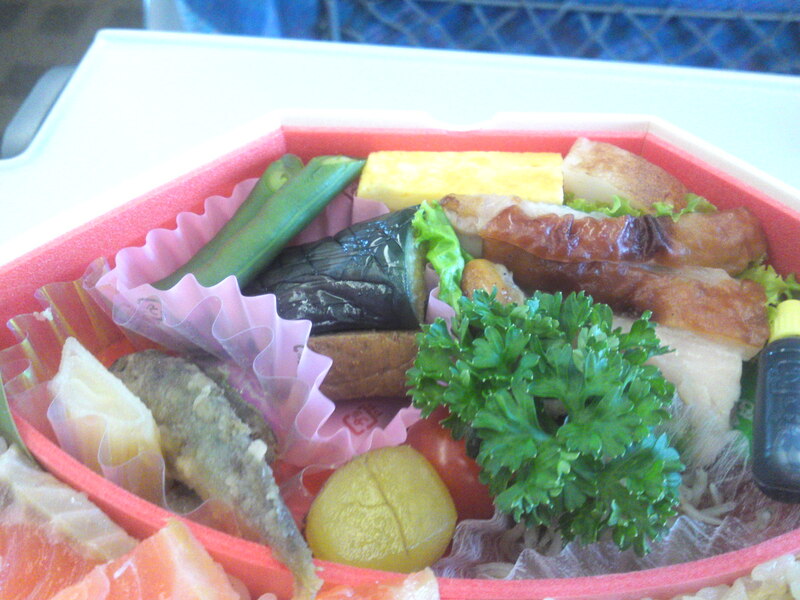 On my way to work today I decided to stop at Kakegawa JR Station and sample my first ekiben sold in that station! 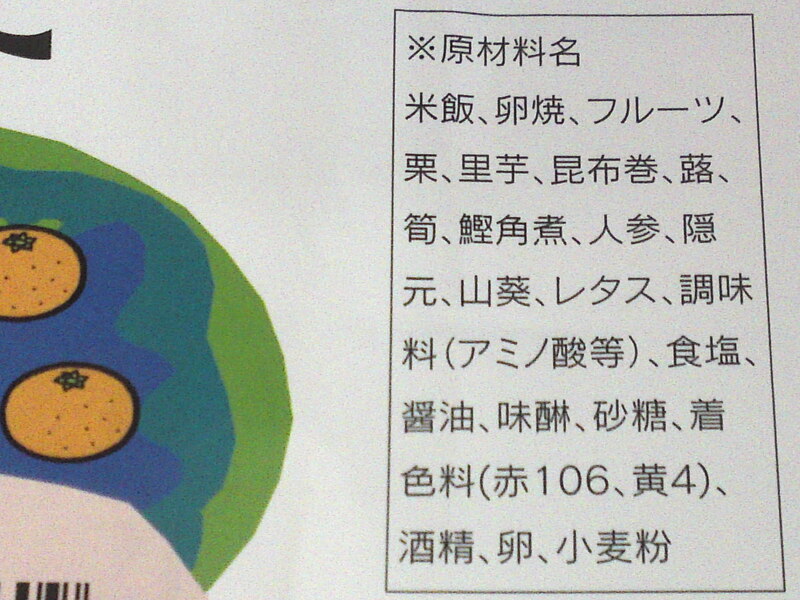 The name “Kenkadako/喧嘩凧/ means fighting kites ( the playthings, not the birds), another name given to the Hamamatsu Festival. 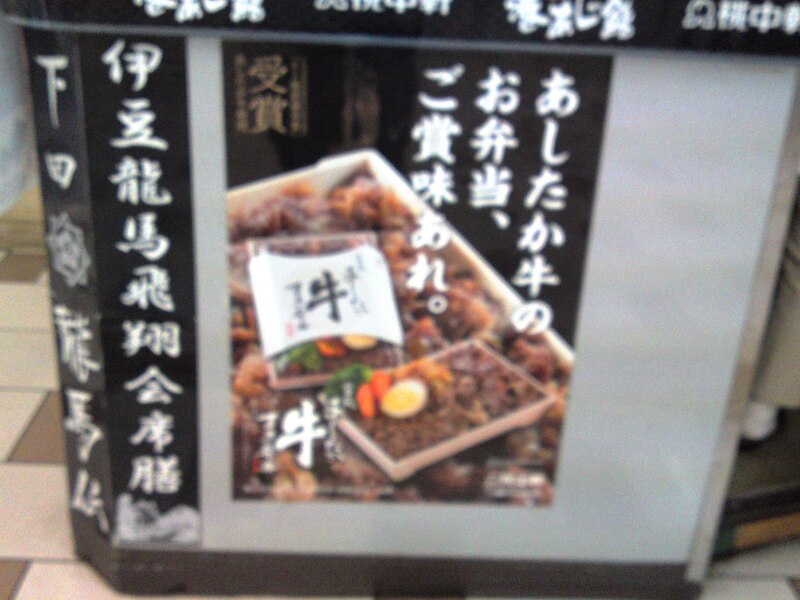 The same ekiben is sold at Hamamatsu and Kakegawa JR Stations where the Shinkansen/Bullet Train stops by Jishotei co./自笑亭株式会社. 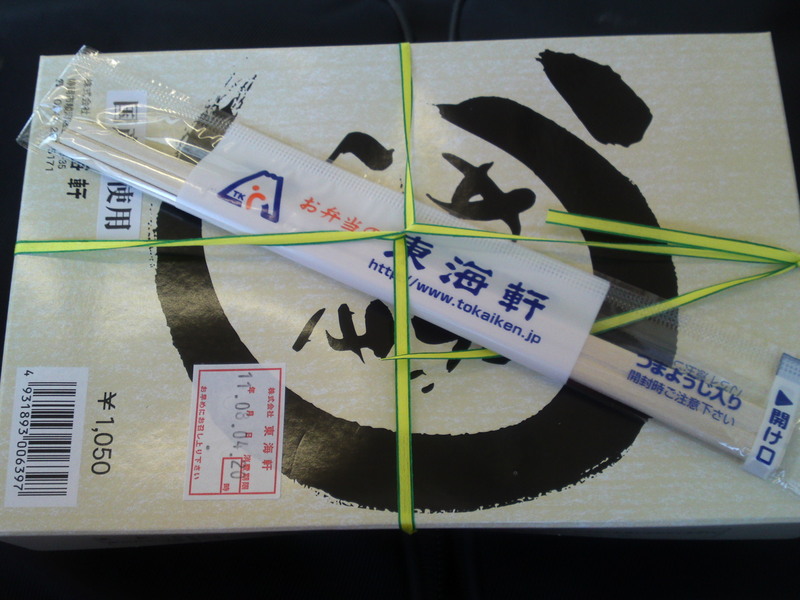 A wet towel and chopsticks are graciously provided with the name of the company. 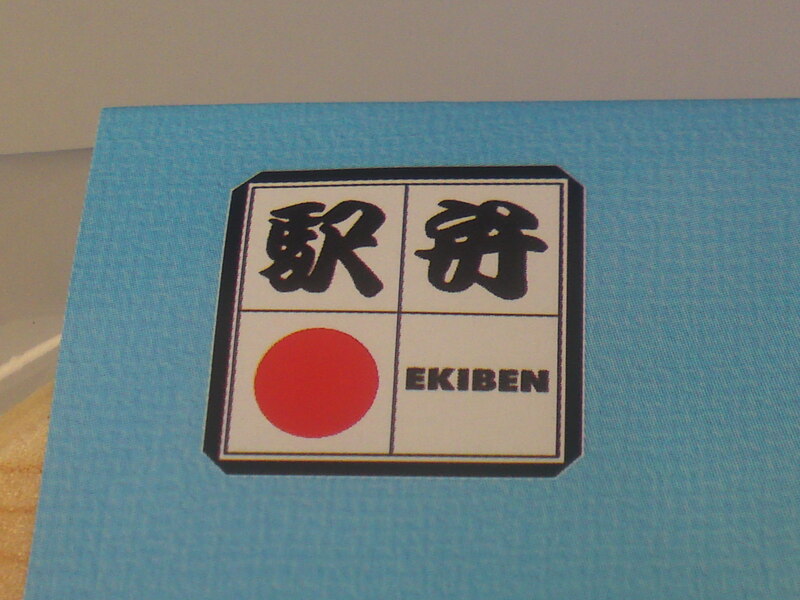 The box cover would definitely be a must-get collector’s item for the ekiben fan! All the different designs are real emblems of family kites seen in the air (they are truly enormous!)! Have a look HERE for a great picture collection of the event! 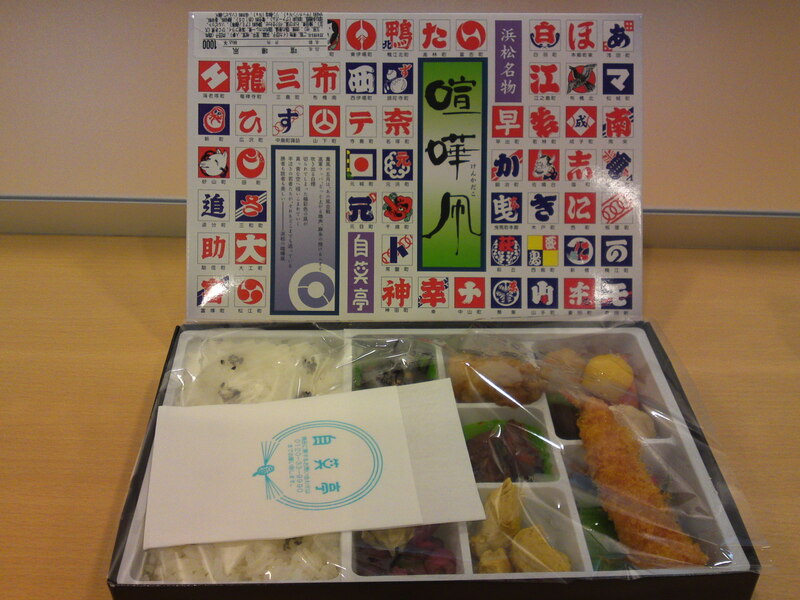 Like any other worthy company, Jishotei Co. clearly indicates the contents of the box! One more paper towel is provided while the contents are well protected by an extra transparent hard sheet of paper. Now, what do we have there? 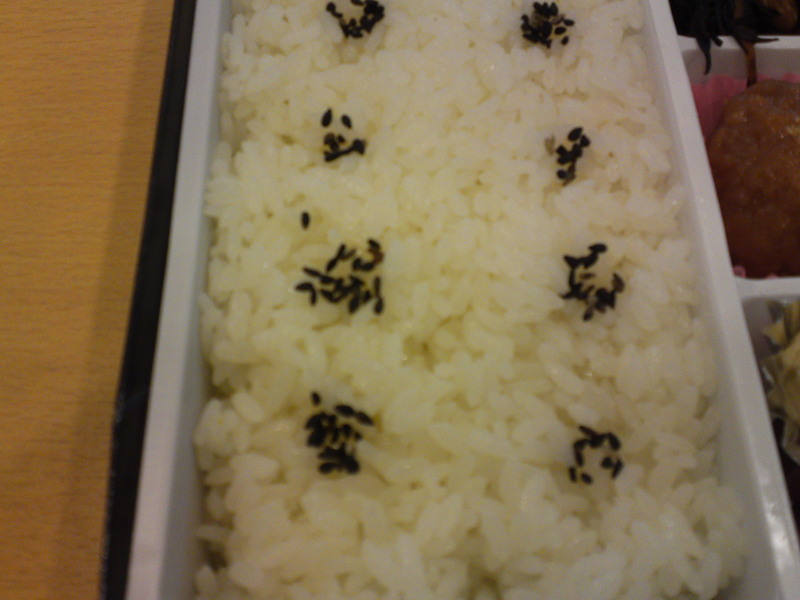 Plain steamed rice with black sesame seeds. Wasabi Zuke/wasabi stems and leaves pickled in sake white lees to accompany the rice and red pickled cucumber. Curried chicken (popular anywhere, isn’t it?). 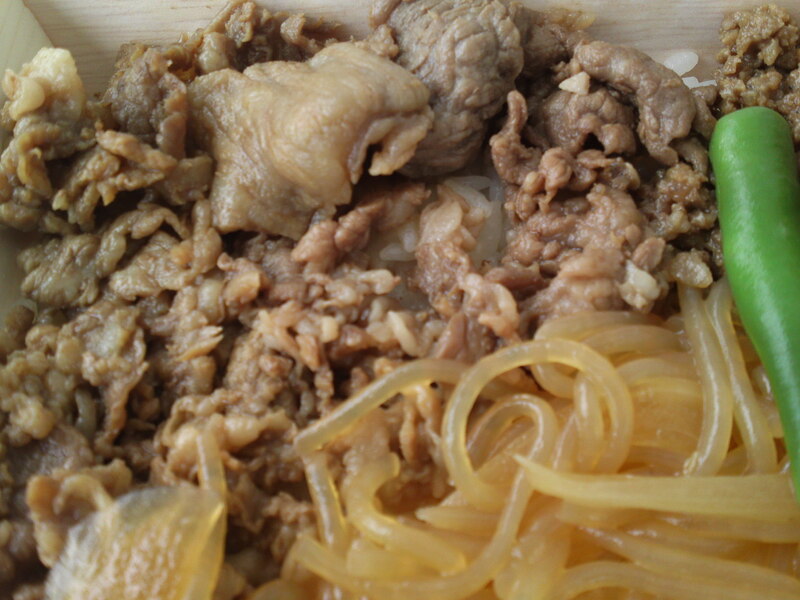 Nikudango/肉団子/ Meat ball made with minced chicken and onions. 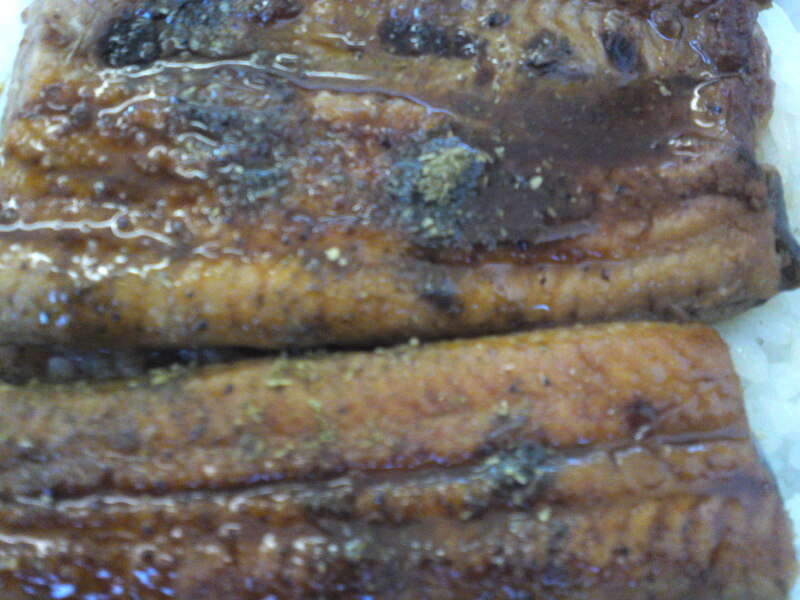 Unagi Dani/鰻田煮/broiled eel. 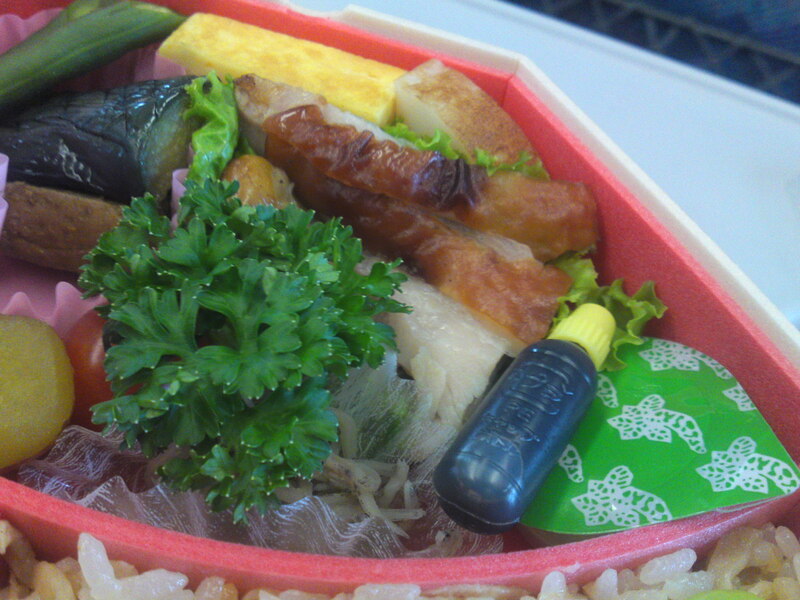 Eels are a famous product from Western Shizuoka Prefecture! 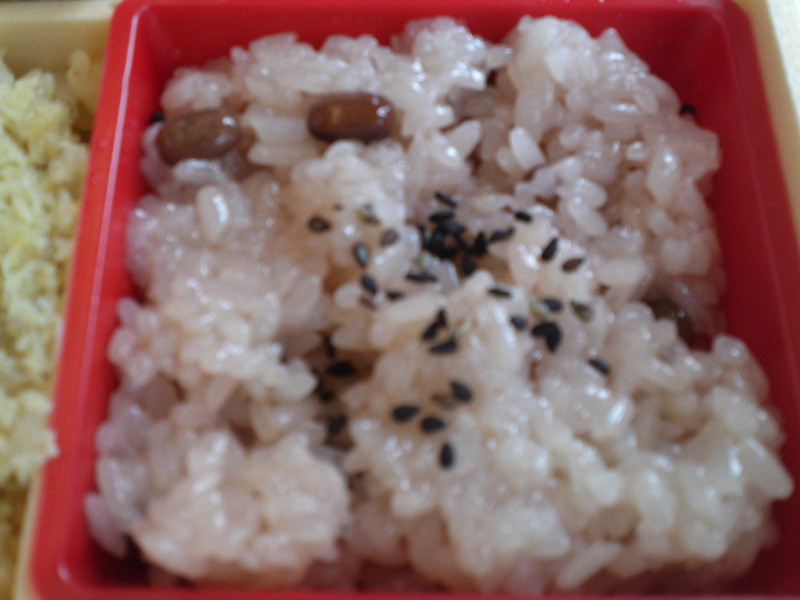 Hijikini/ひじき煮/simmered hijiki sweet seaweed with soy beans. 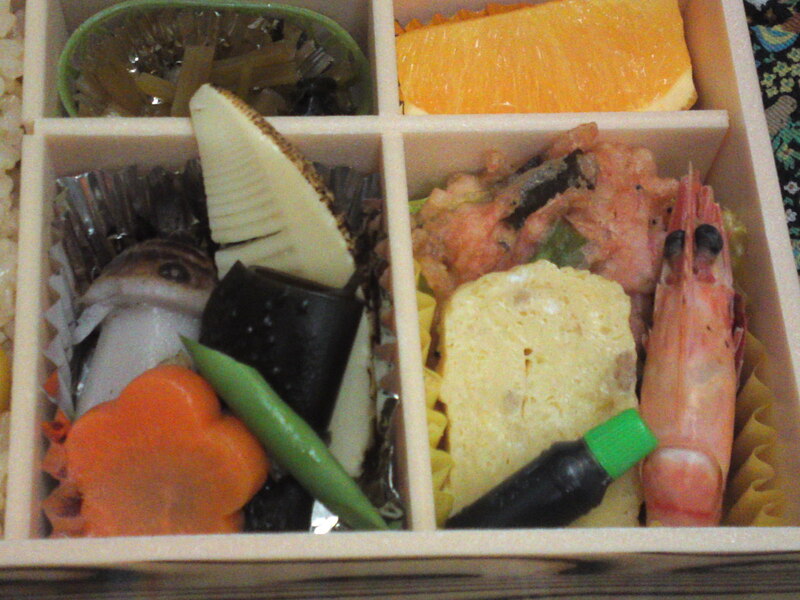 Simmered shiitake mushroom, ikadango/イカ団子/steamed cuttlefish paste ball, two kinds of colored (green and gray) balls of konnyaku/蒟蒻/elephant’s foot tuber, boiled satoimo/里芋/taro, simmered sweet kuri/栗/chestnut and ninjin/人参/carrot. Very satisfying and so intriguing! And yummy! Been in a bit of a hurry today and couldn’t prepare any schedule or meal. 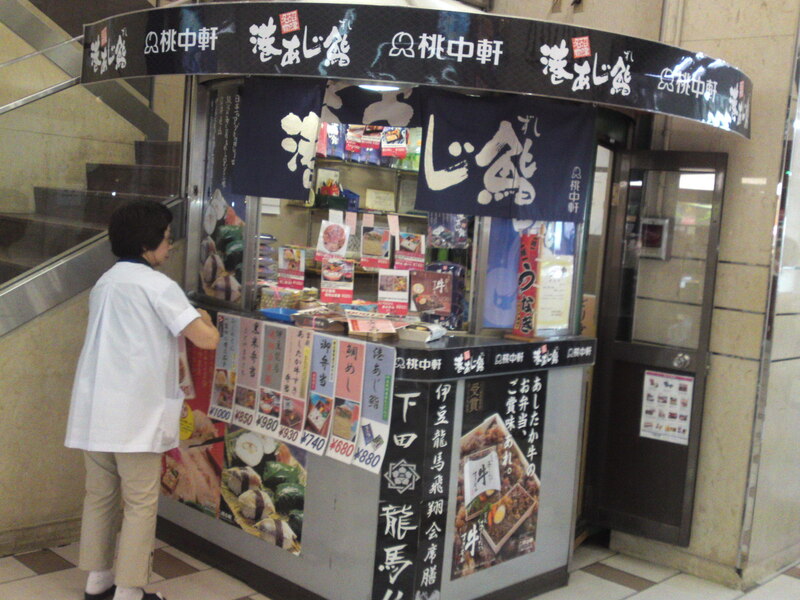 I decided to visit the ekiben stand in Shizuoka City JR Railway Station for the first time in 3 weeks! 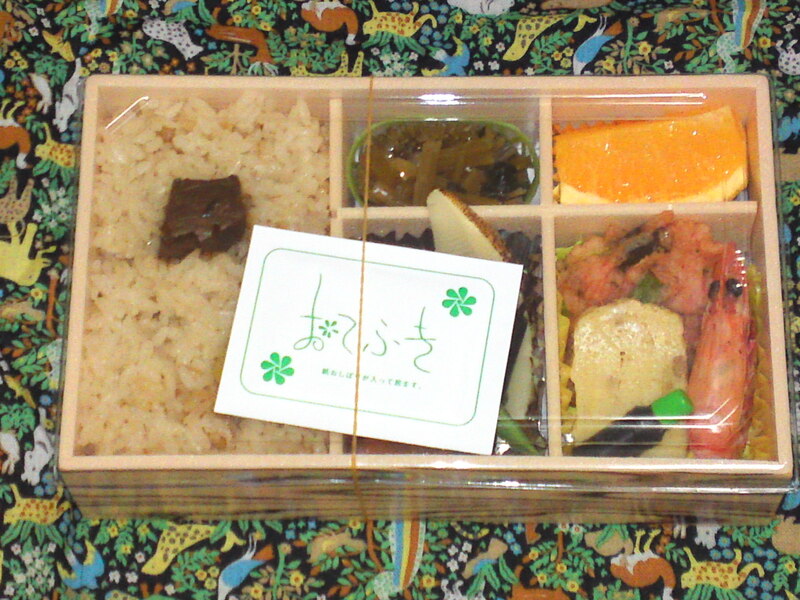 There I acquired an ekiben I had been wanting to sample for some time: Furusato Bento/Home Town (Home Country) Bento! 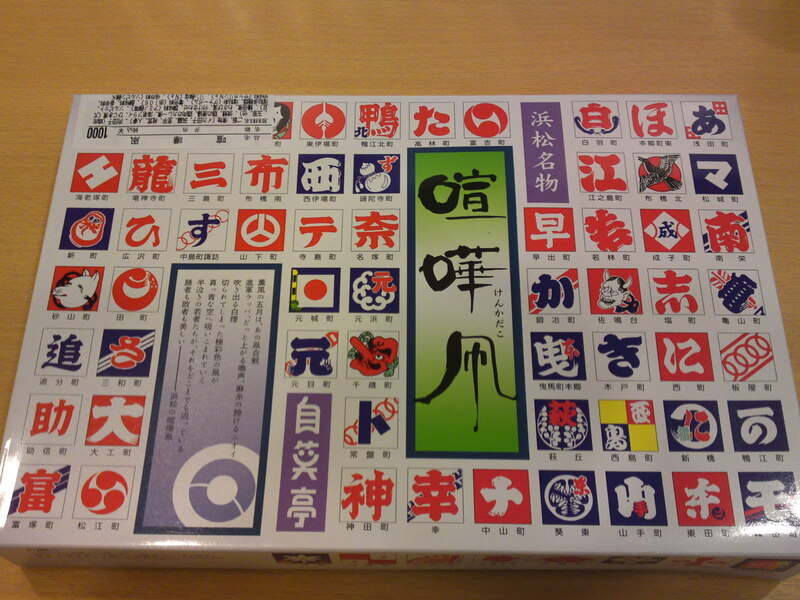 The wrapping paper ia almost a collector’s item showing the main agricultural products of our Prefecture! Can you see them? Shizuoka Prefecture is most famous in Japan not only for Mount Fuji, but also for its green tea, oranges, strawberries and musk melons! 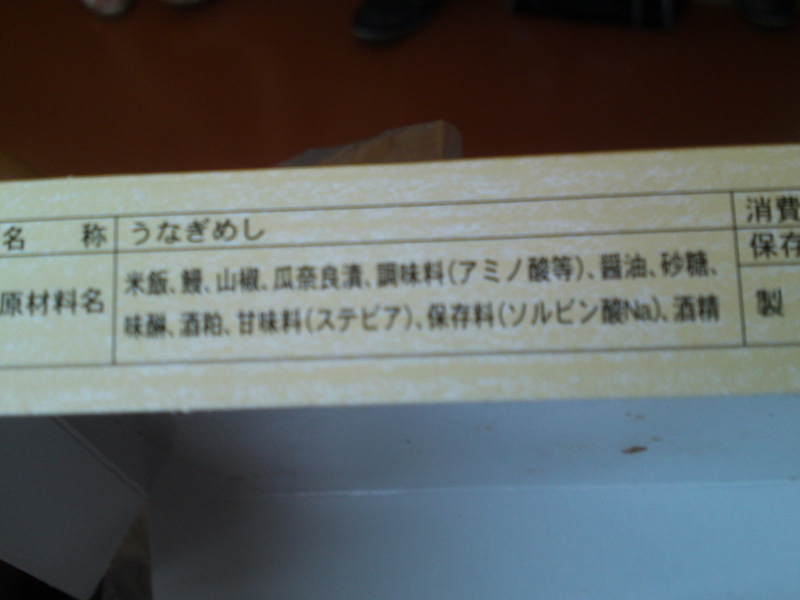 As usual, Tokaiken Co. had clearly stated the ingredients on its wrapper! 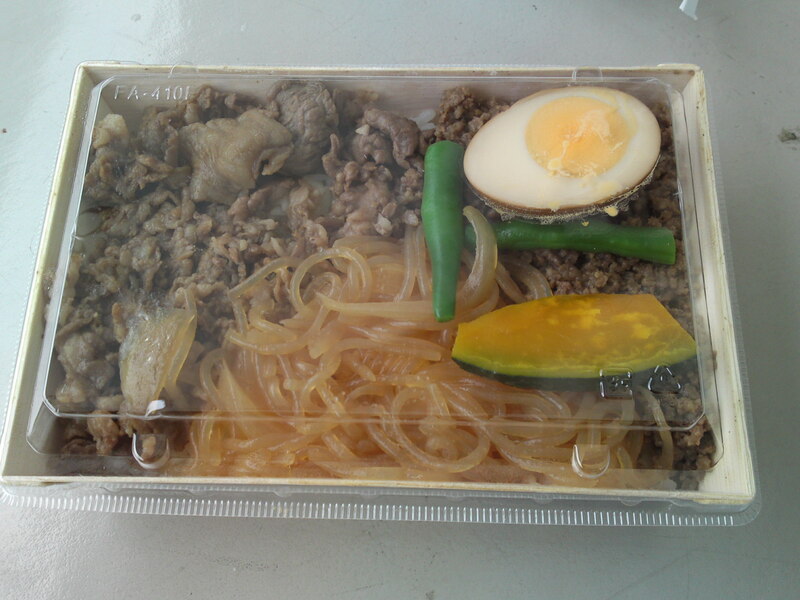 The food was well protected by the hard transparent paper cover. A hand towel was also provided. Good hygiene! 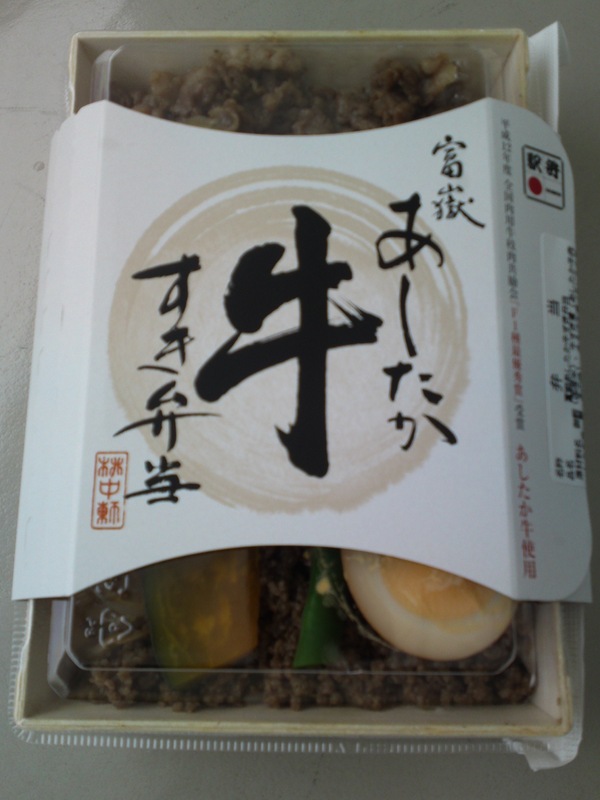 The rice was steamed with the juices of the Katsuo kakuni/鰹角煮/Simmered bonito, another typical product of Shizuoka Prefecture and a preserved chestnut. Plenty to accompany the rice! Simmered and boiled vegetables: Boiled carrot. 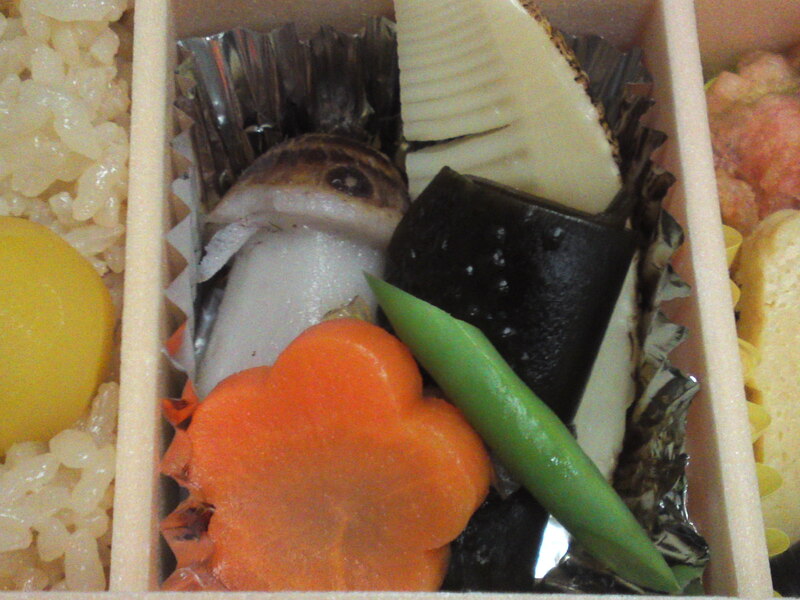 Boiled taro/sato imo and cut in the shape of a mushroom! String bean. 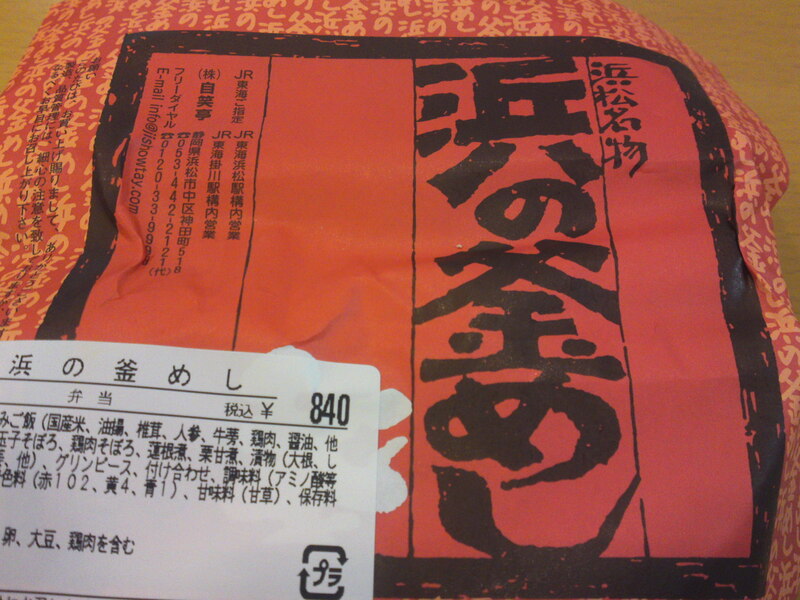 Konbu maki/simmered seaweed roll. 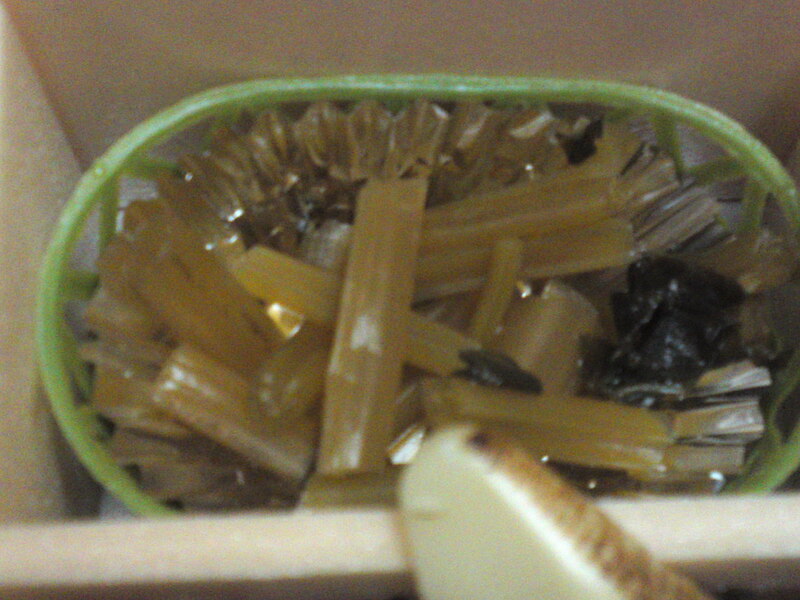 Bamboo shoot. Fuki/蕗/giant butterbur. 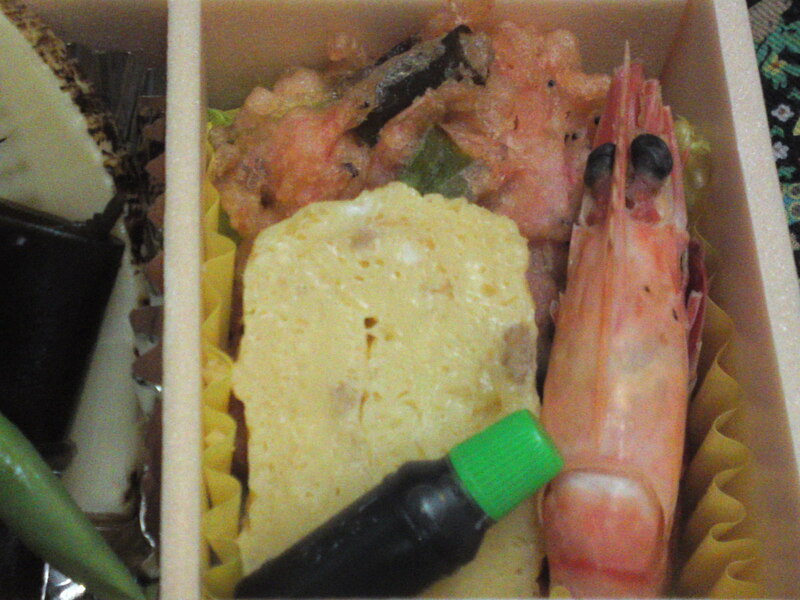 Boiled shrimp, small bottle of soy sauce, tamagoyaki/Japanese omelette, lettuce and another specialty of Shizuoka: sakuraebi kakiage/Cherry shrimps tempura! 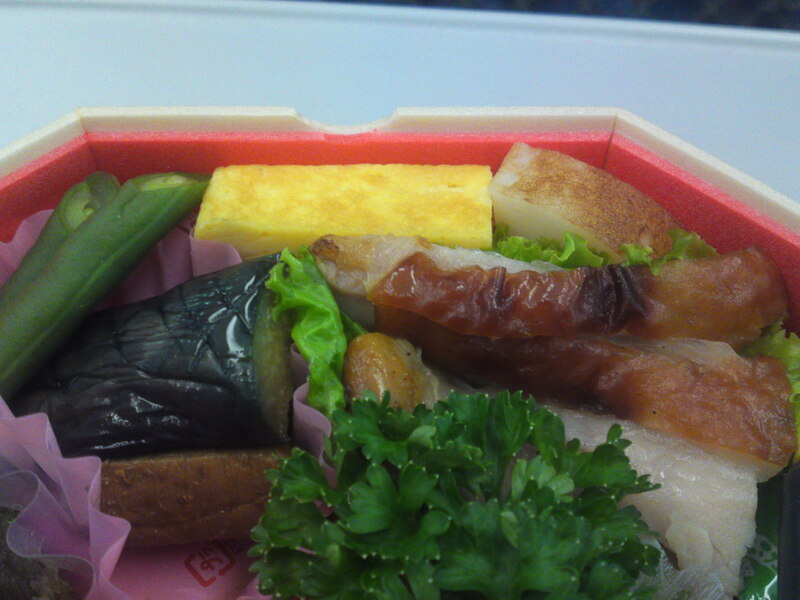 And one more specialty from Shizuoka: pickled wasabi stems and leaves! 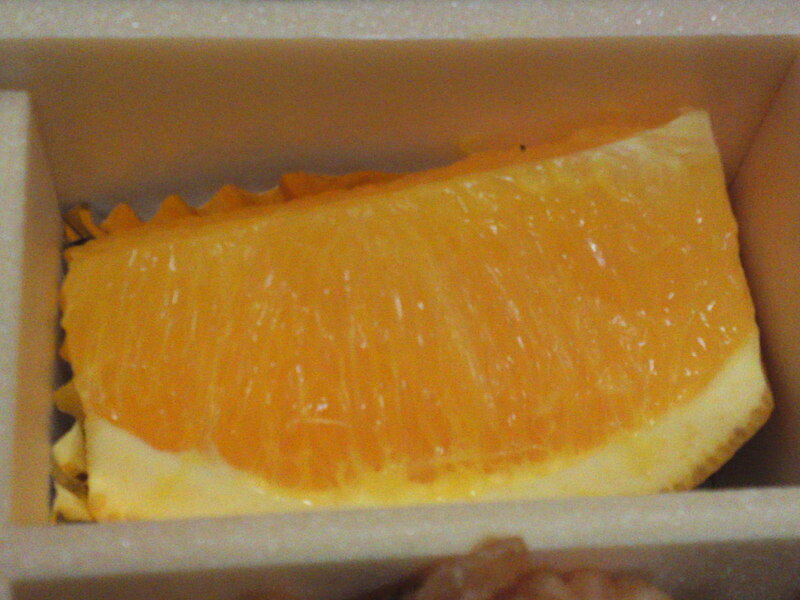 And for dessert, a fruit from Shizuoka: Orange! 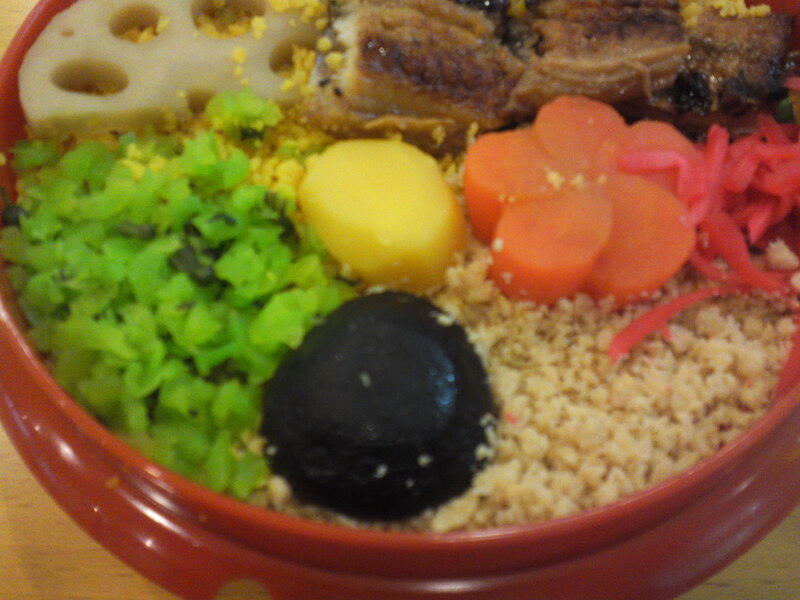 This ekiben was well-balanced with no meat but only seafood, eggs and vegetables, but was still very tasty and fulfilling! 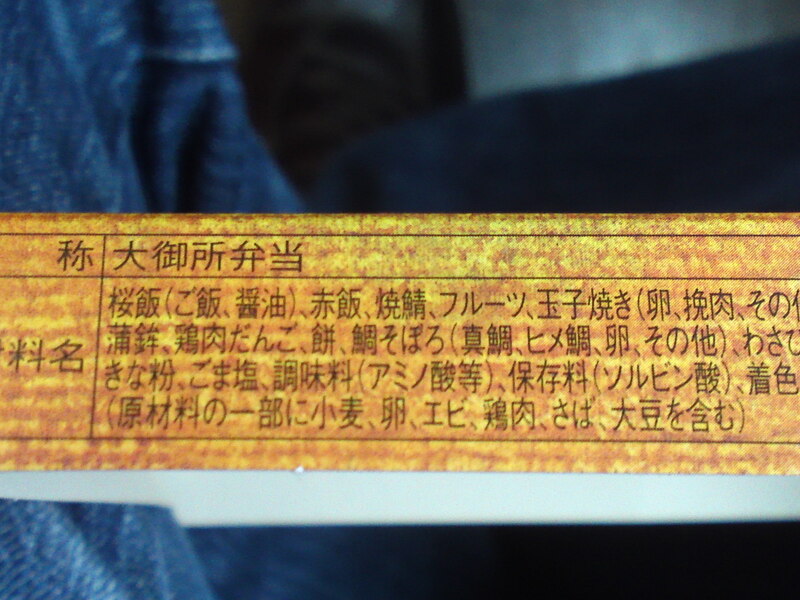 Oogoshyo/大御所 stands for “Lord” or “Leading Figure” in Japanese. Actually in this case it stands for the first Shogun of the Edo Era, Tokugawa Ieyasu who retired in Sumpu, presently called Shizuoka City! 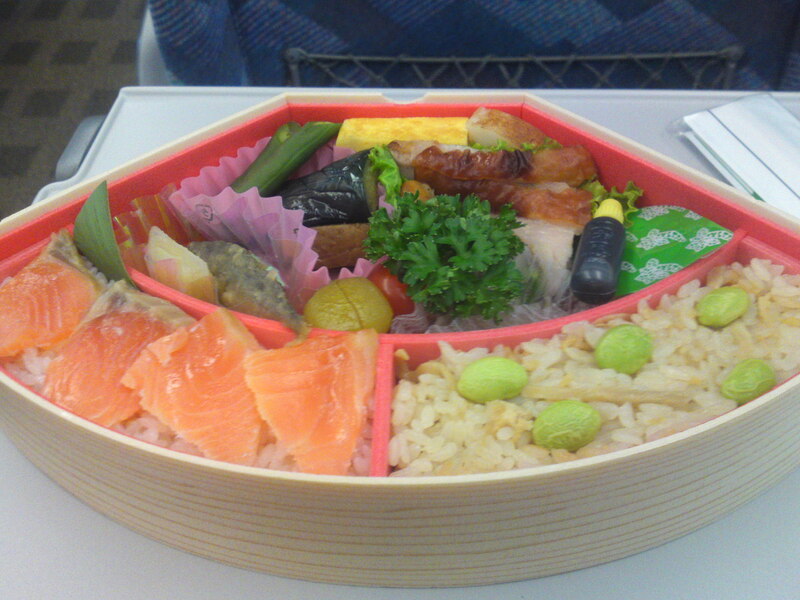 The Ekiben as I bought it at Shizuoka JR Station today. 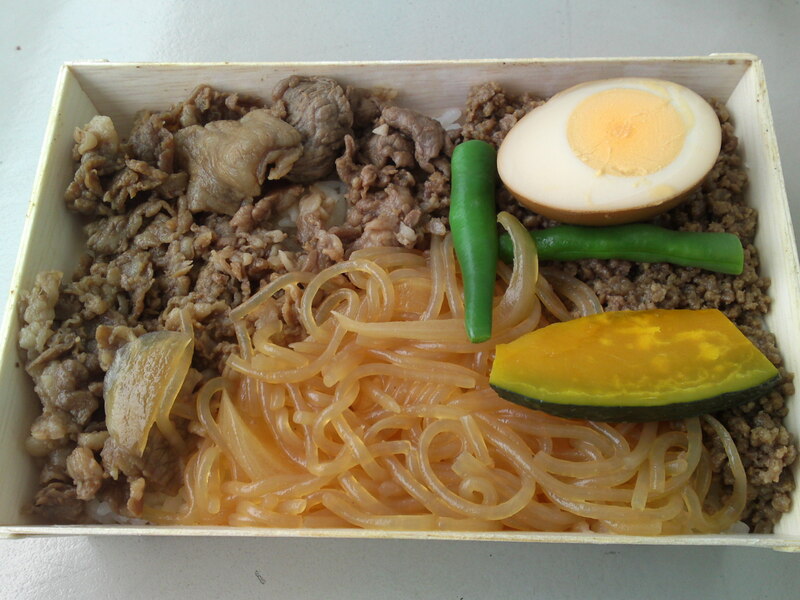 They call it bento but it is a real ekiben sold inside the station! 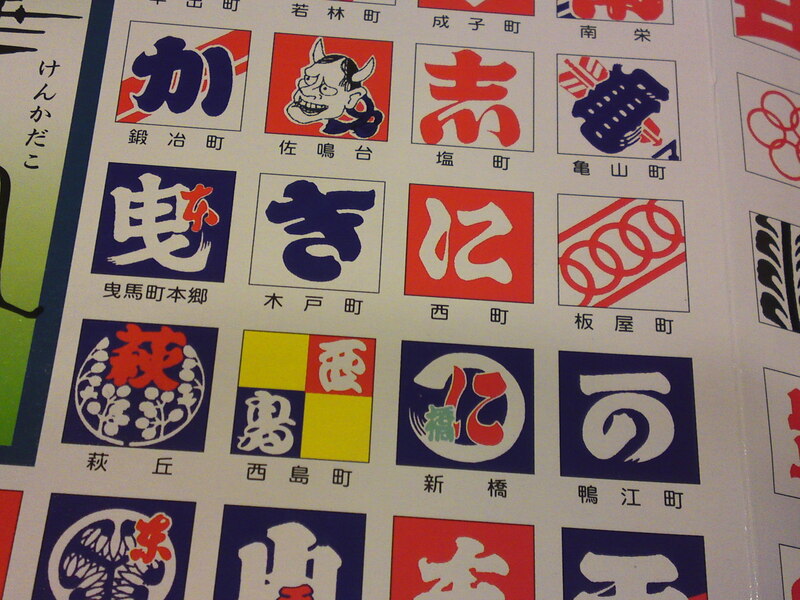 The “mon” or Japanese arms/family crest (heraldry) is the mon of Tokugawa Ieayasu! 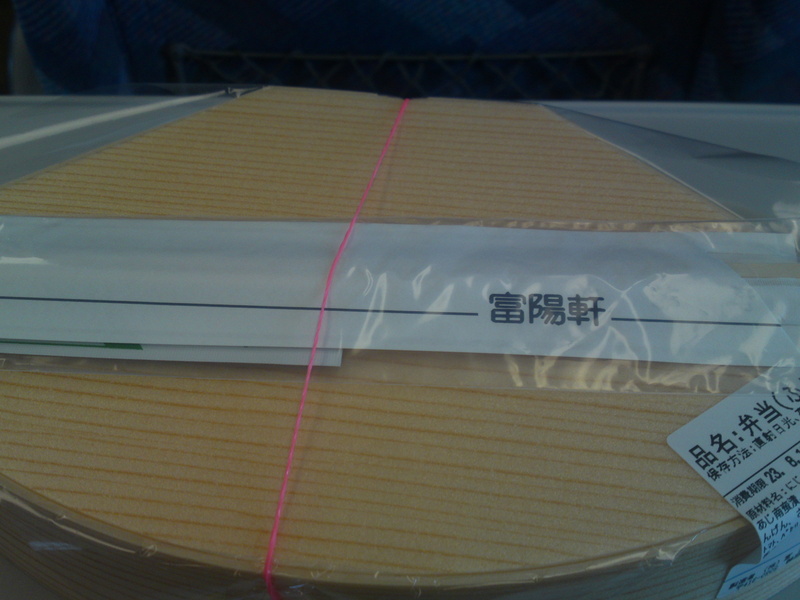 A piece of translucent paper protects the contents! 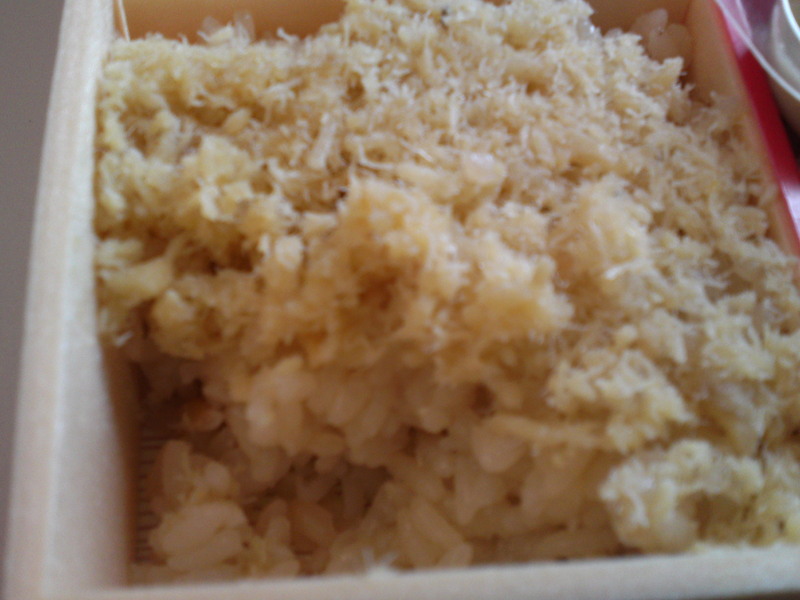 I introduced this kind of rice in the previous ekiben. 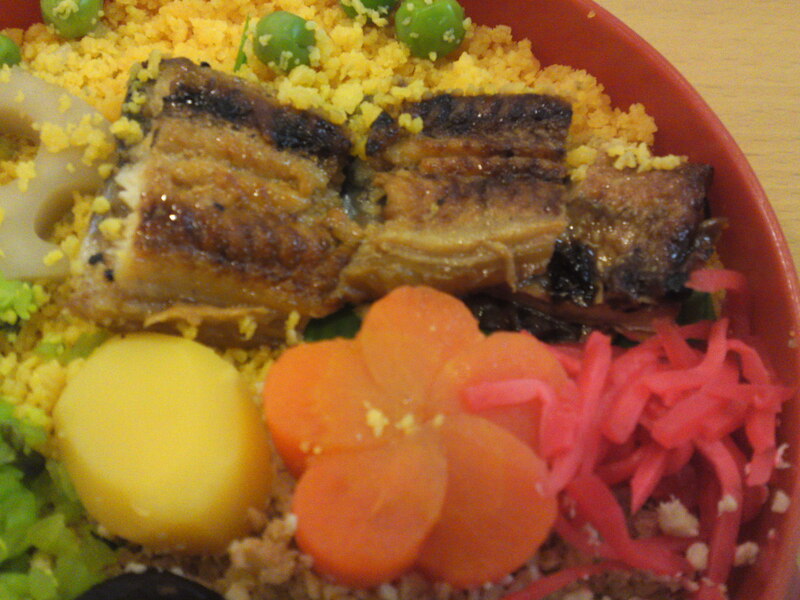 It is called “sakura han/Cherry tree rice” and is covered with finely flaked tai/ 鯛/red grouper and the rice is a mazegohamn/rice mixed with the juices of the simmered fish. Actually the whole rice in Japanese is called “tai soboro” and is made with two types of seabream called “madai” and “Himedai” and some egg. 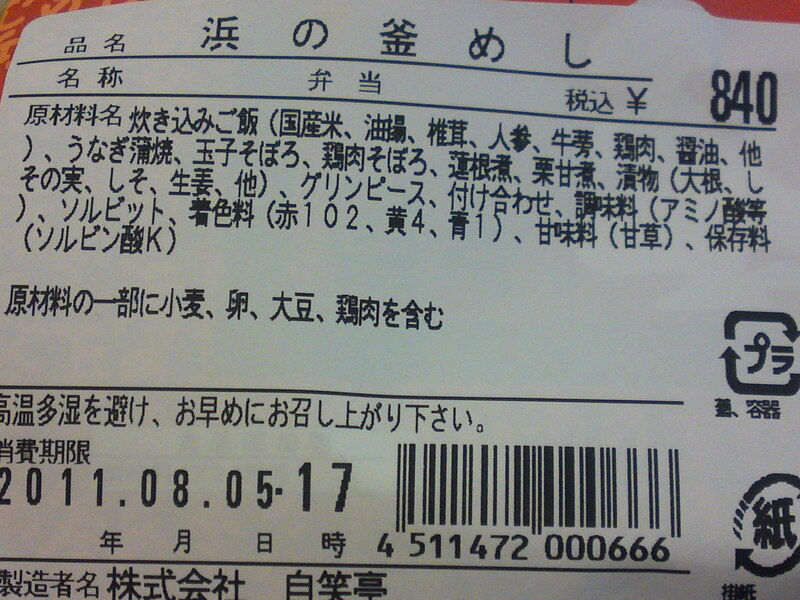 “Sekihan赤飯/” or “red rice”. Red is a color for celebrations in Japan. 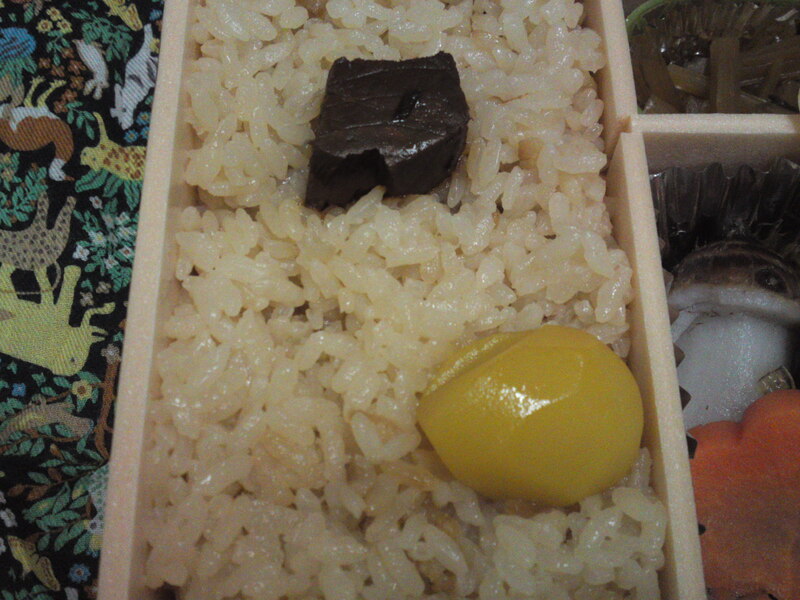 This sekihan is made with glutinous rice and azuki beans making for a thick, nourishing staple as served for unknown ages in this country. 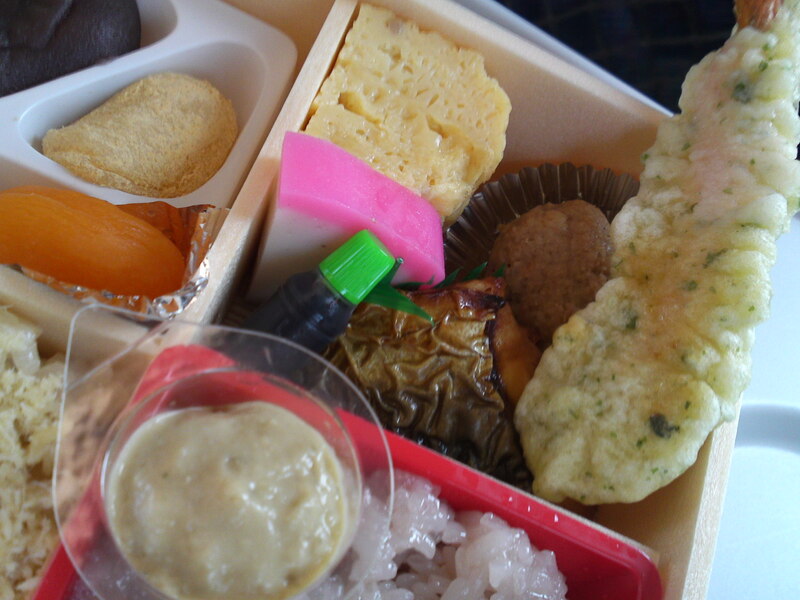 Now to the side dish: prawn tempura, grilled mackerel, kamaboko/steamed fish paste, tamagoyaki/Japanese omelette, chicken ball/niwatori dango and soy sauce “bottle”. The same (clearer picture!) 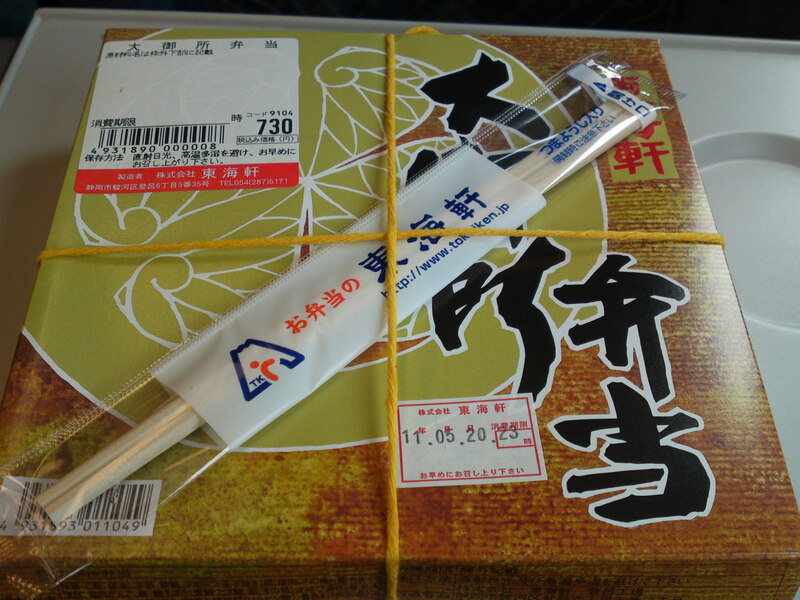 with the opened “capsule” of wasabizuke/wasabi stems and leaves pickled with sake white lees. 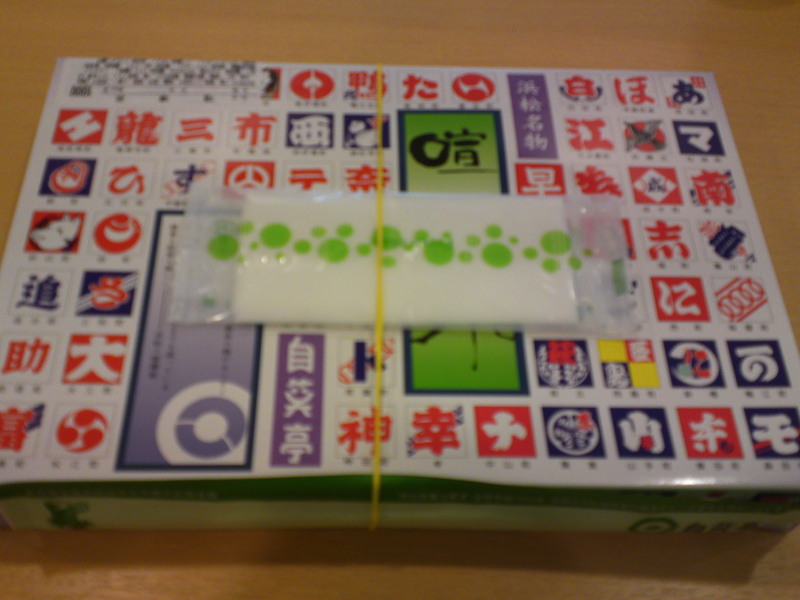 The dessert box with the wasabizuke “capsule”. 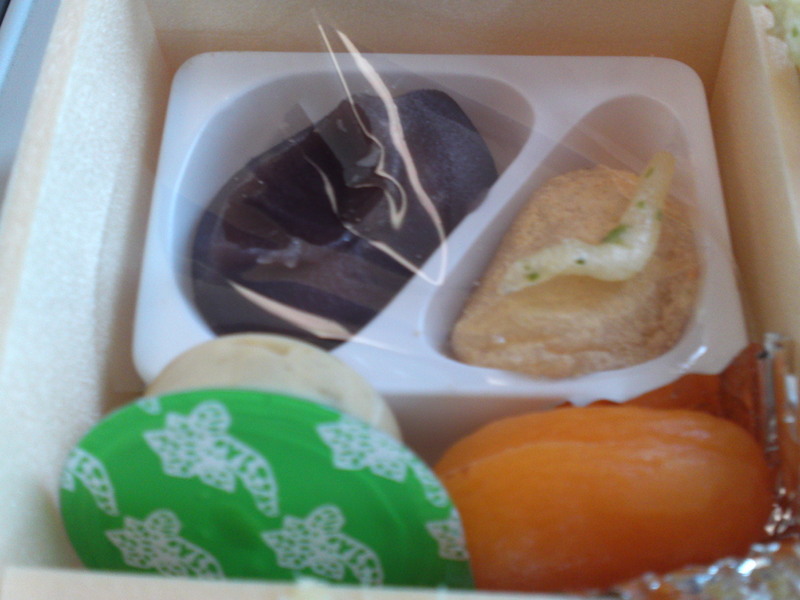 The apricot and the “wagashi” were protected by an extra film of translucent paper. 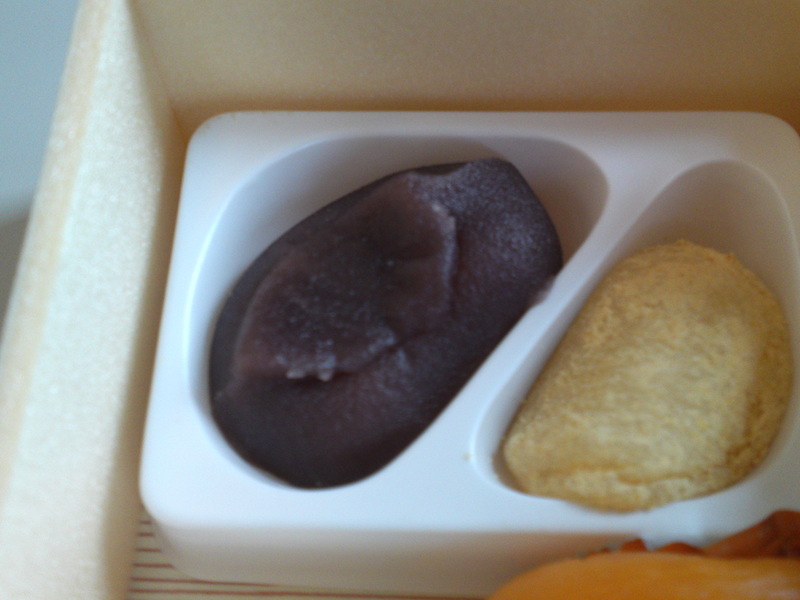 The two types of wagashi: the one on the left is made with o-mochi/glutinous rice paste and sweetmeats/anko and the second one is a gli\utinous rice ball covered with kinako/soy bean powder.